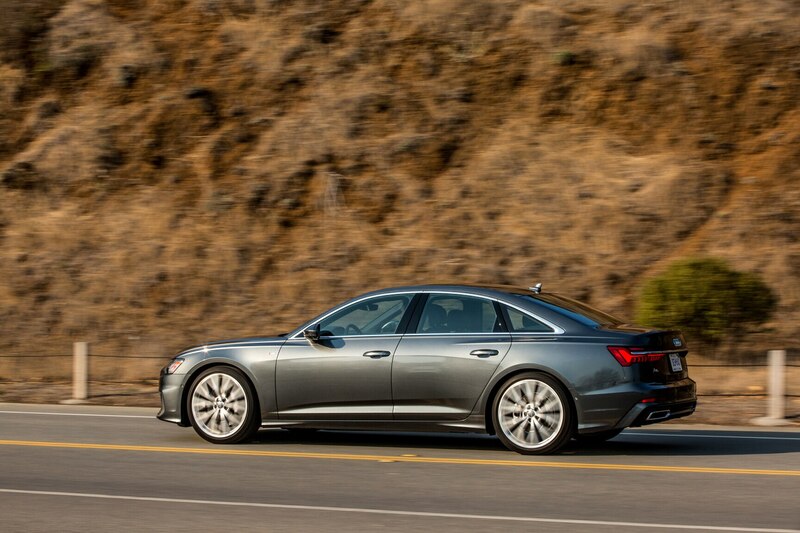 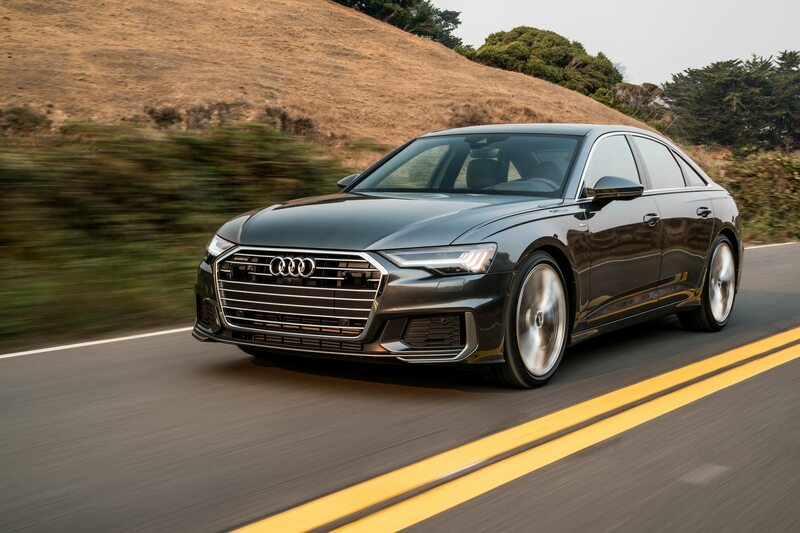 SAN FRANCISCO, California — Apple CarPlay connects wirelessly in the 2019 Audi A6 and A7, though Android for Auto still requires a hard wire. 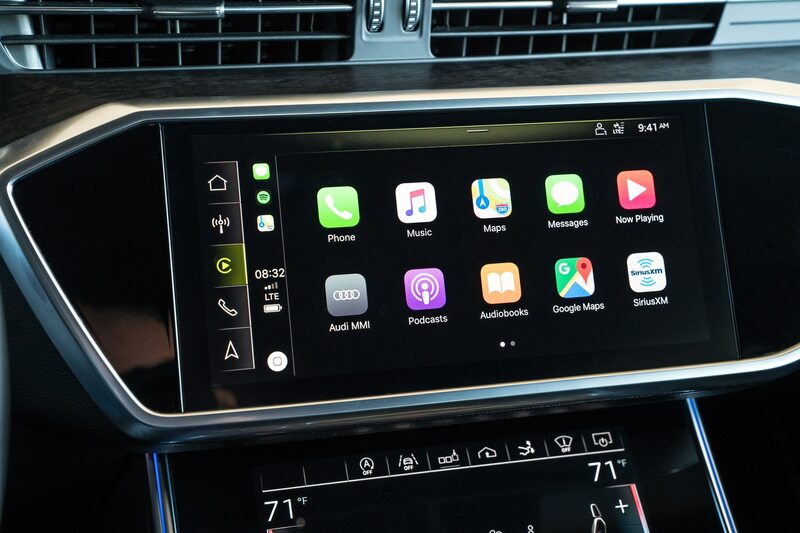 That’s roughing it in a luxury sedan these days, and when my drive partner has trouble fiddling with his phone to work even with the wire, we try my iPhone. 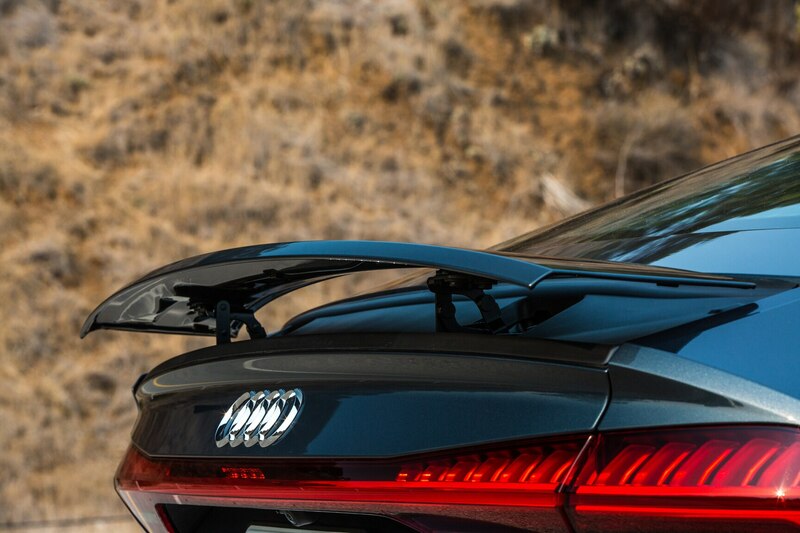 Still no luck. 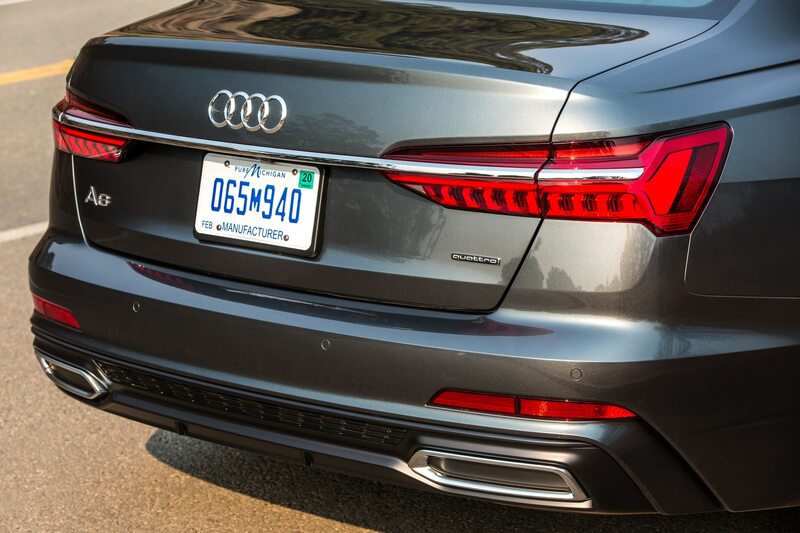 But we’re idling curbside halfway out the parking lane in heavy morning traffic in front of our hotel on Market Street. 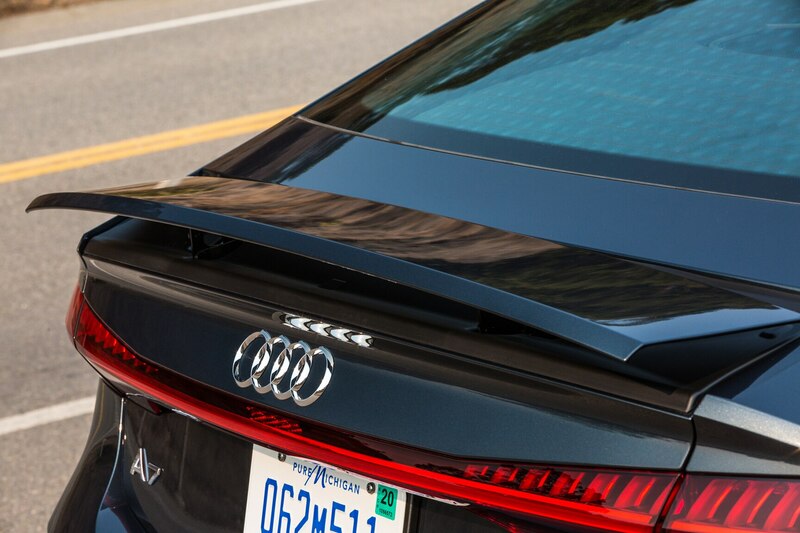 Hit it, Henry. 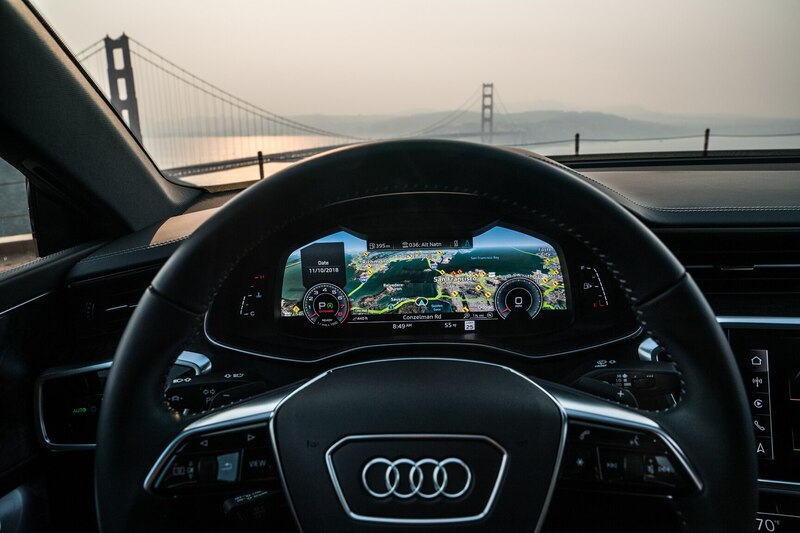 Let’s just drive. 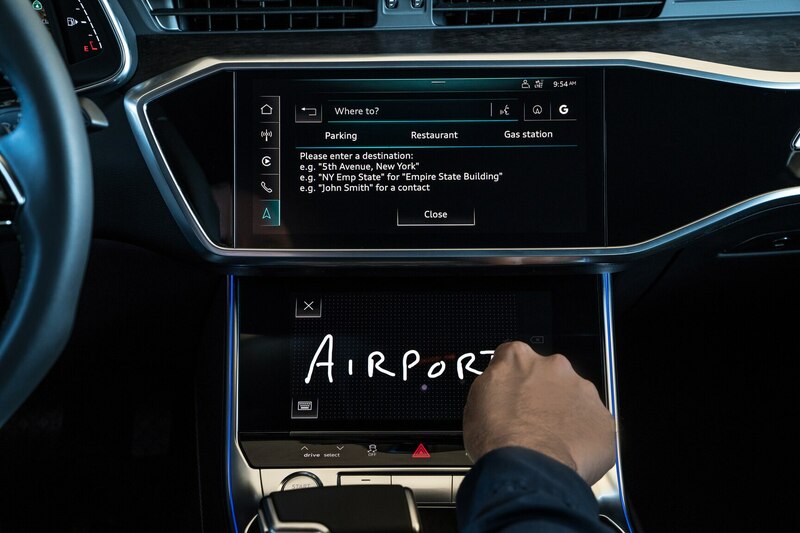 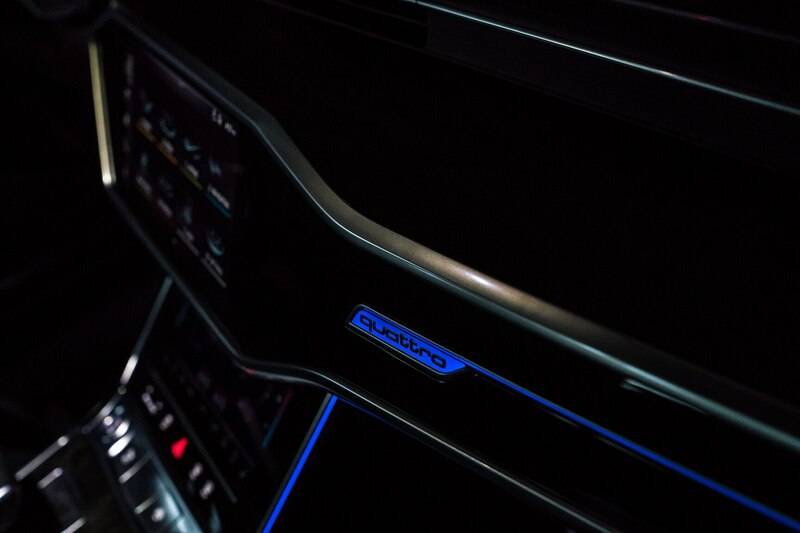 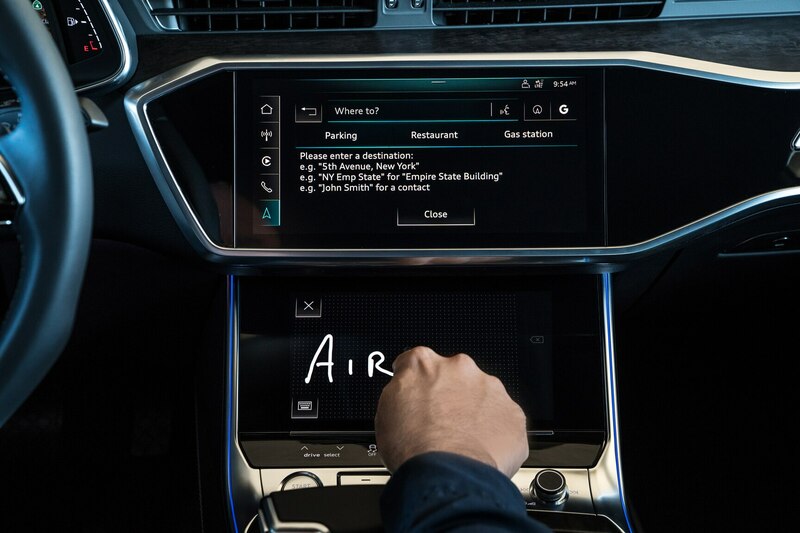 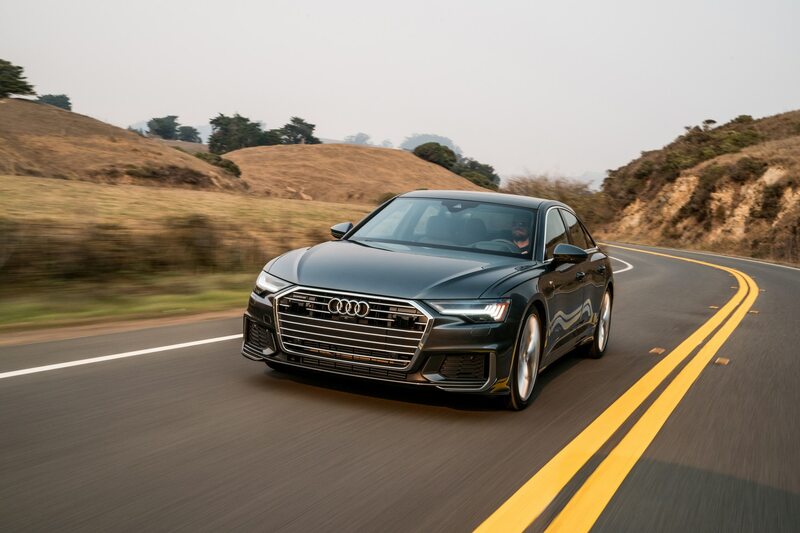 I confess I’m one of those luddites who is underwhelmed by all the connectivity in modern cars, especially the luxury models, and Audi is perhaps most responsible, after Tesla at least, in turning cars and SUVs into rolling workstations. 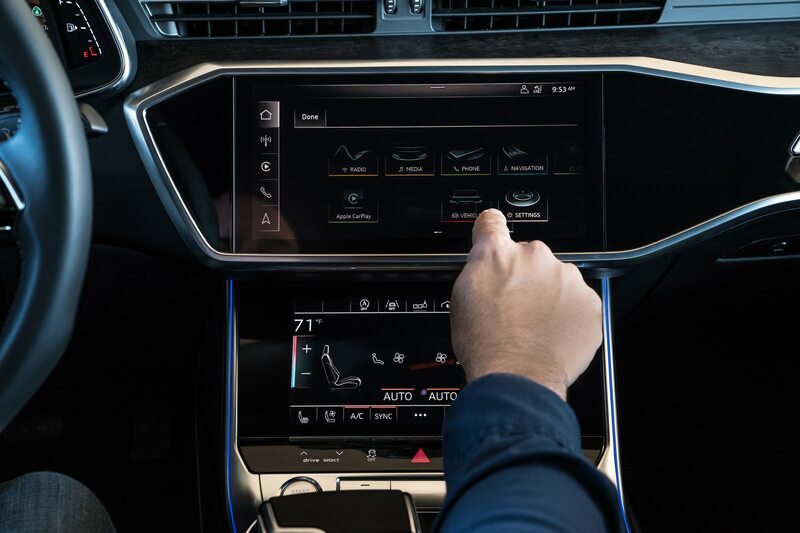 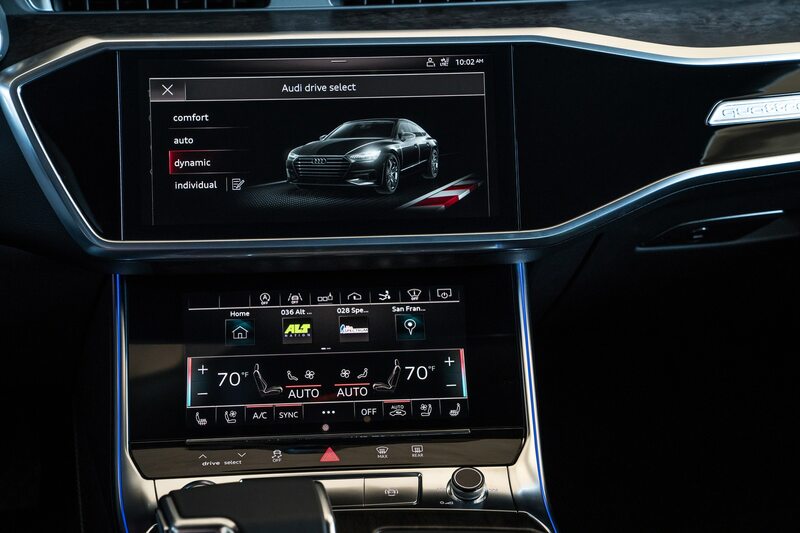 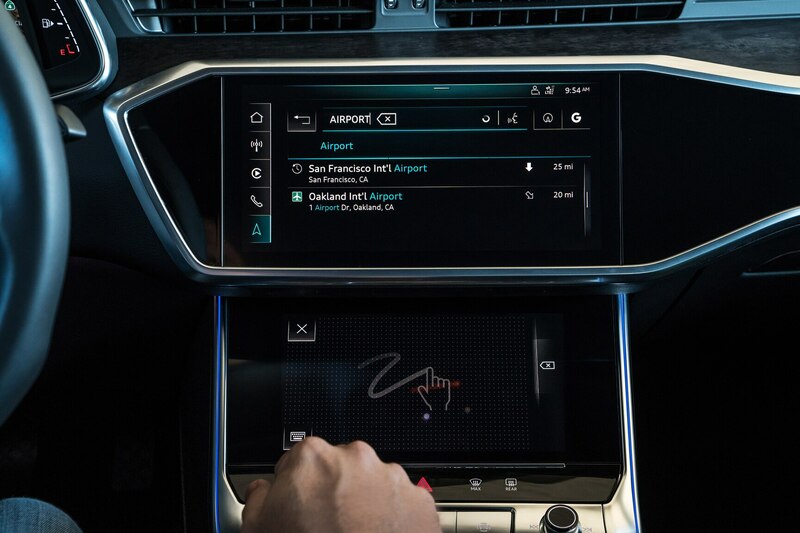 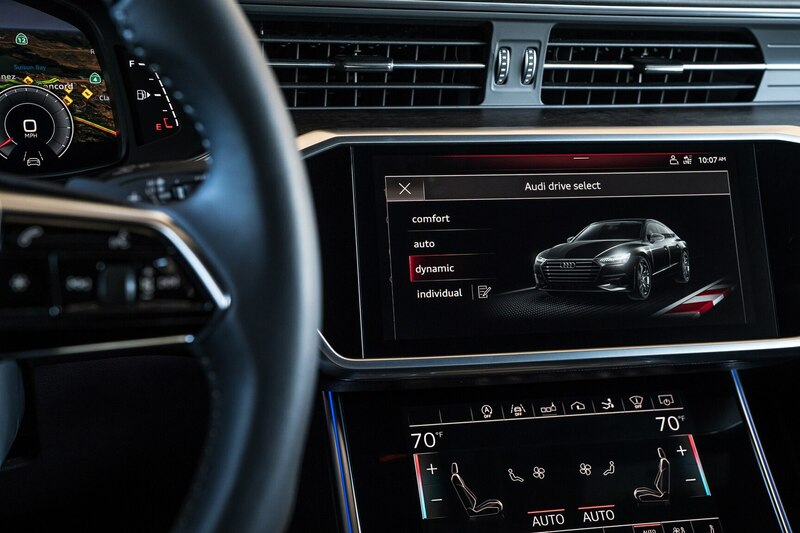 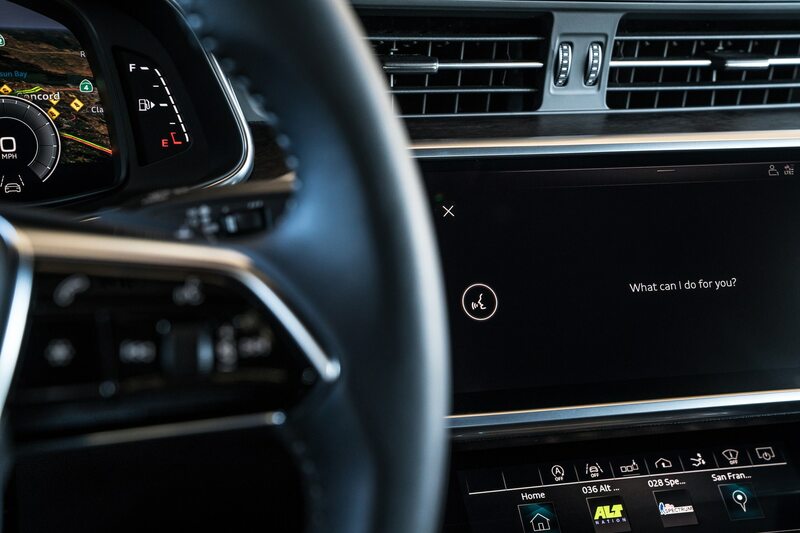 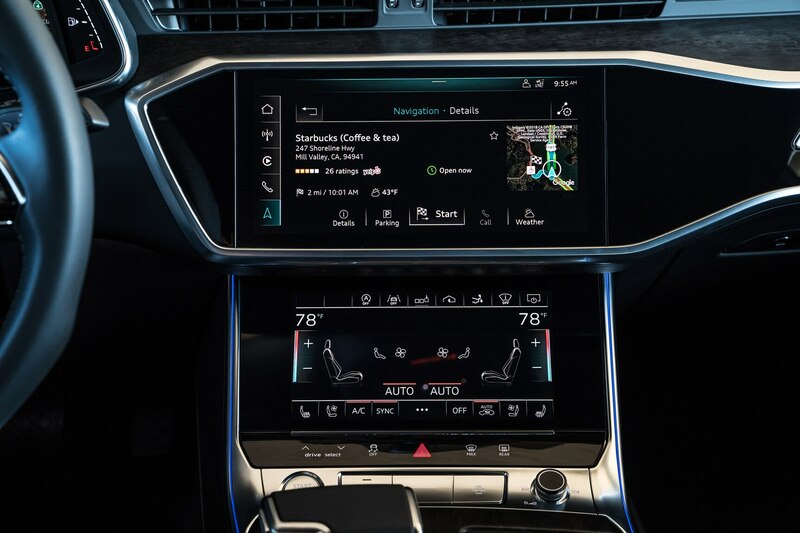 Audi’s venerated MMI—man/machine interface—infotainment touchscreen central controls are much better now, with this new generation of A6es and 7s, just because the touchscreen buttons are no longer simply dots on a touchscreen. 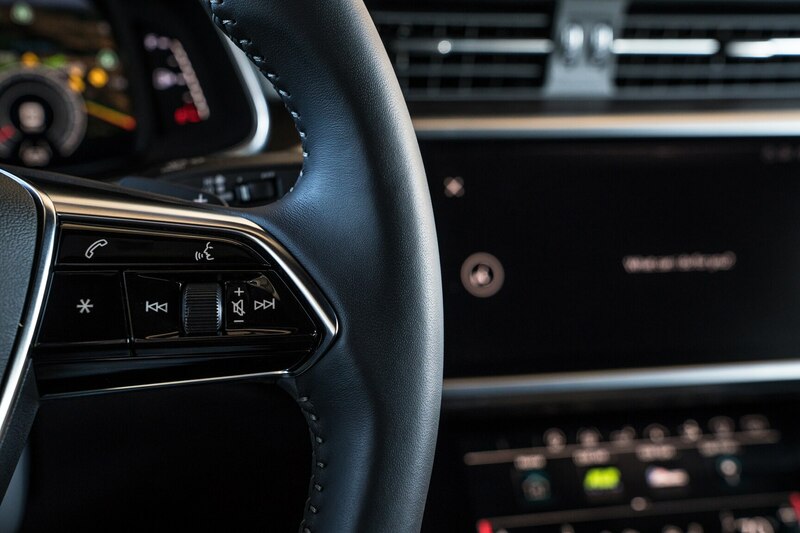 They have indents, and make satisfying little clicking sounds when you try to engage the radio or heating/air con, or any of the other functions. 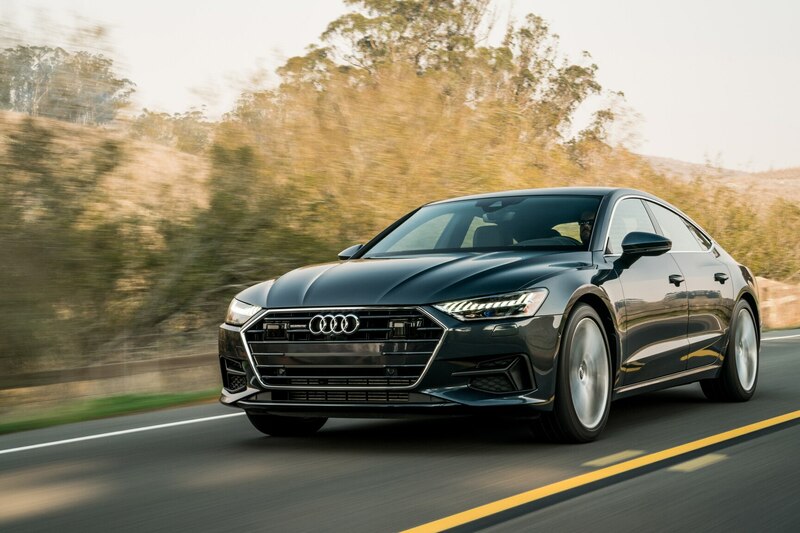 The point is, the latest Audi MMI as found in the new A6 and A7 is as good (or badly a distraction) as anything you’ll find in a luxury brand. The new MMI comes with a head-up display and 12.3-inch virtual cockpit, and the screen is 8.6-inches lower on the pleasingly mid-century look dashboard. 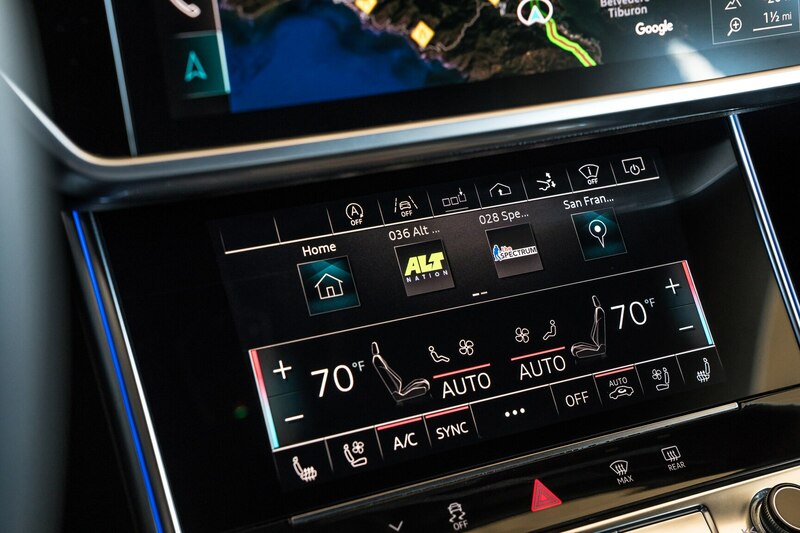 It’s better because of the tactile/haptic clickety-click feedback, even if you still find yourself scrolling through several pages to find a function that once had its own dashboard knob or button. 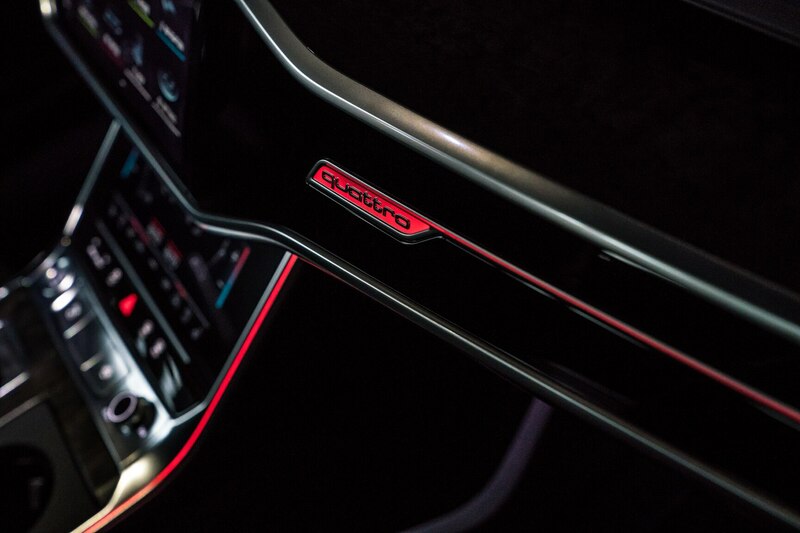 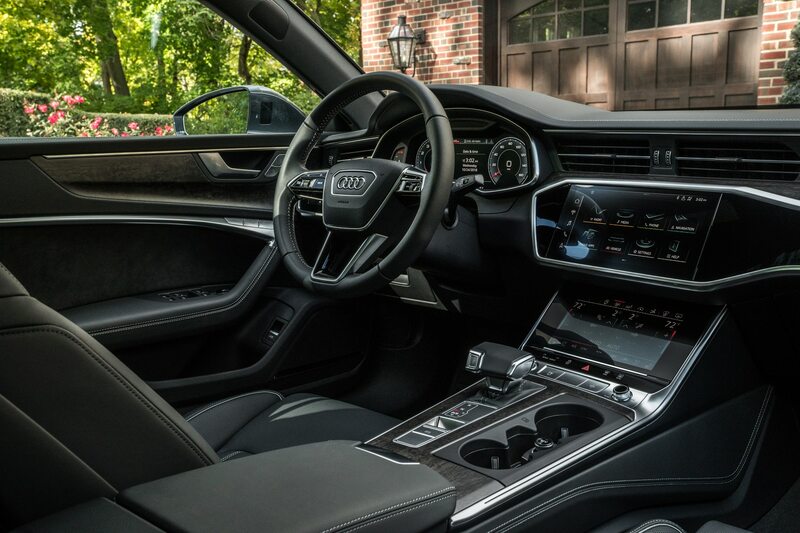 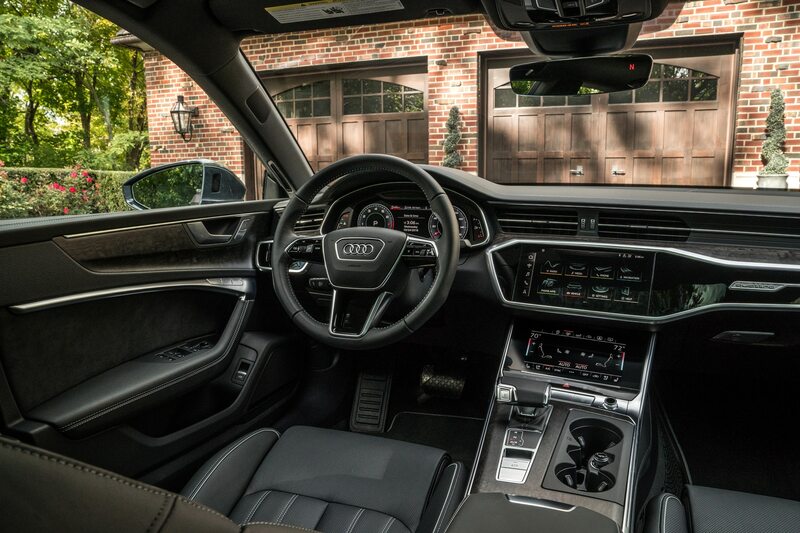 Take this feature that my driving partner found almost by accident, while searching for another function: in the 2019 Audi A6 Prestige, a touchscreen button gives the driver control over the front passenger seat. 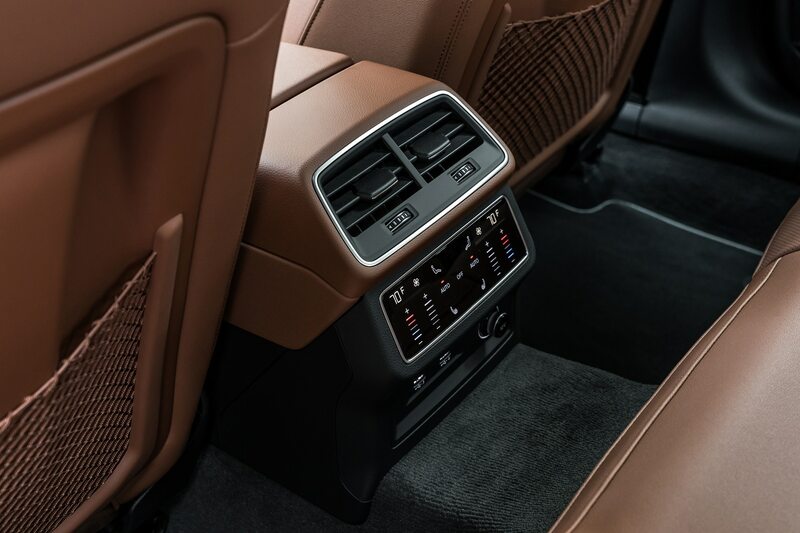 He/she presses the button and uses the eight-way power seat controls on the driver’s side to move the passenger seat. 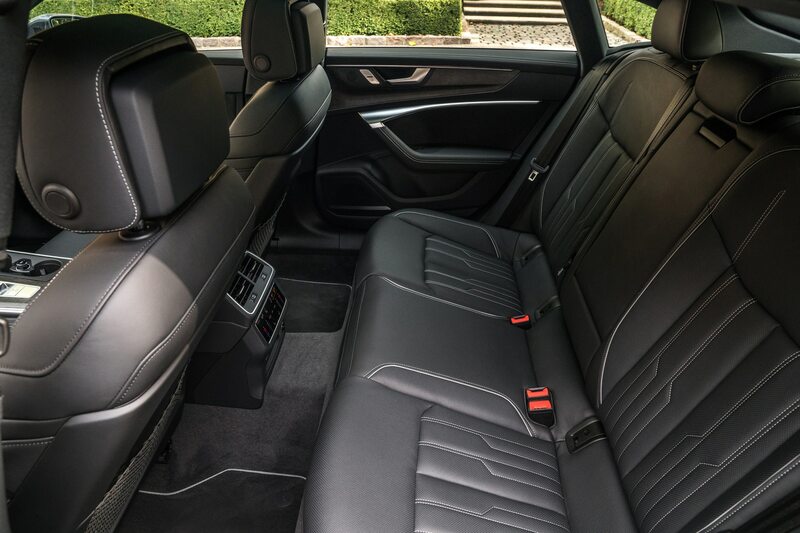 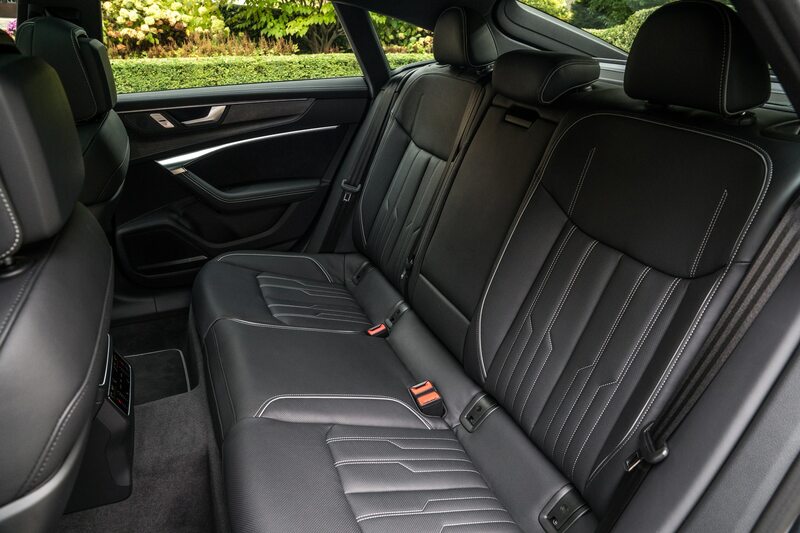 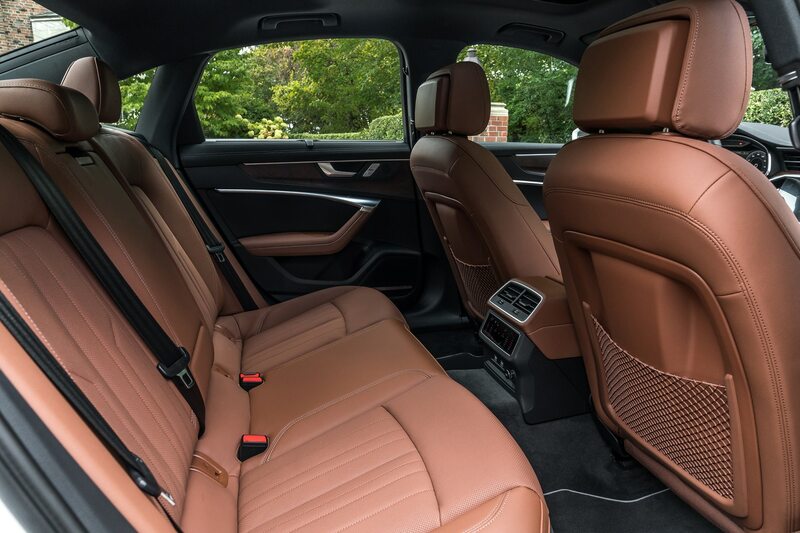 This allows chauffeurs to move that seat as far forward as possible to give the right side rear passenger maximum legroom. 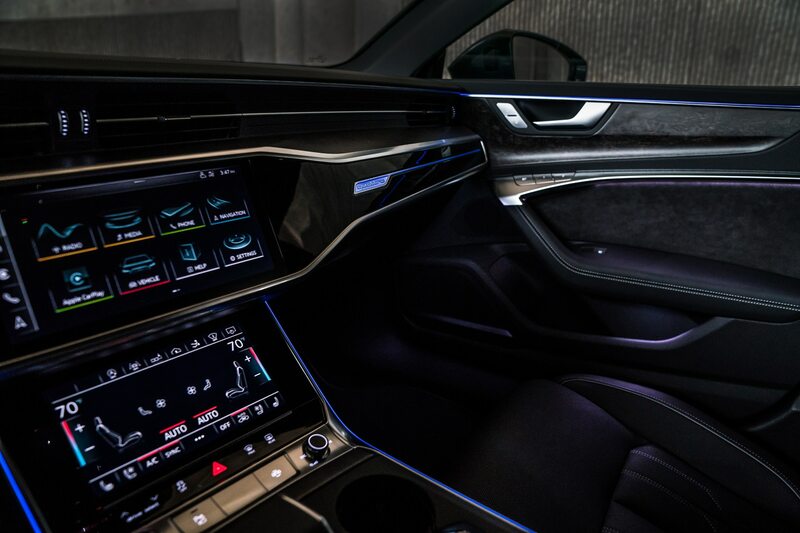 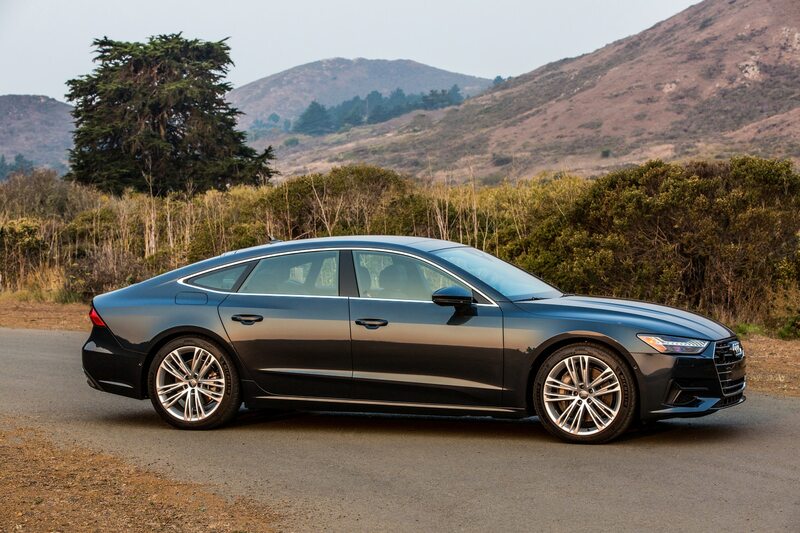 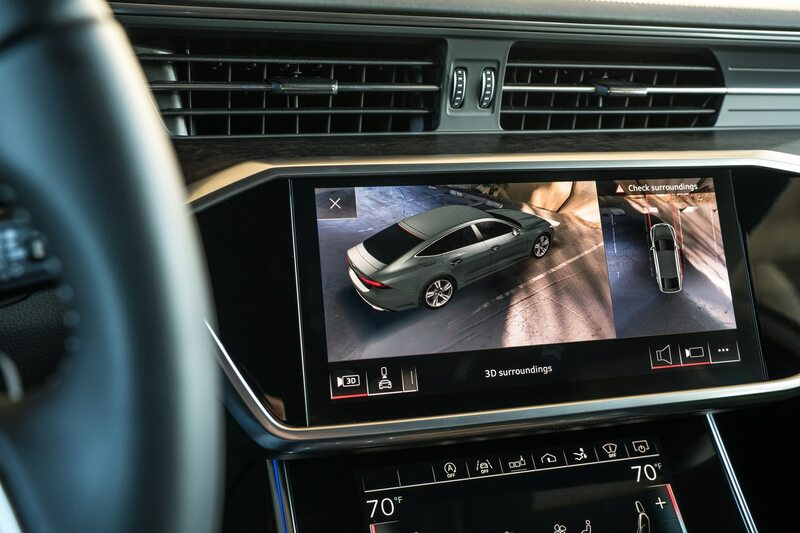 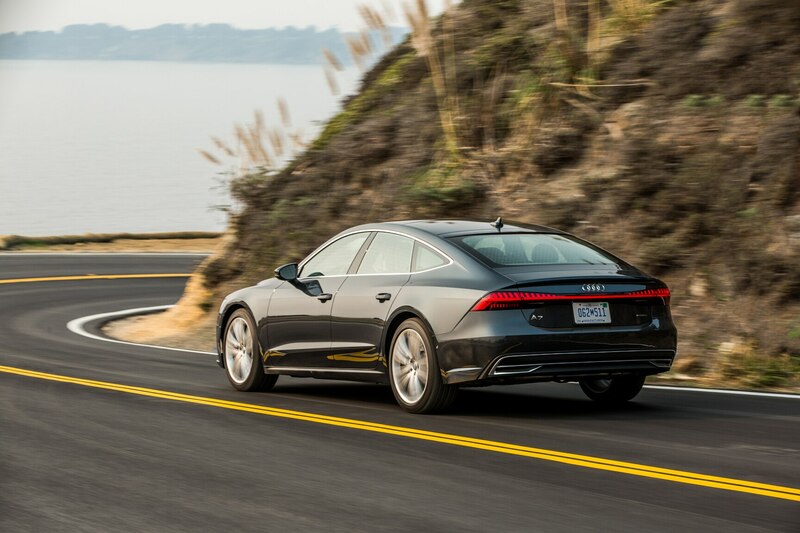 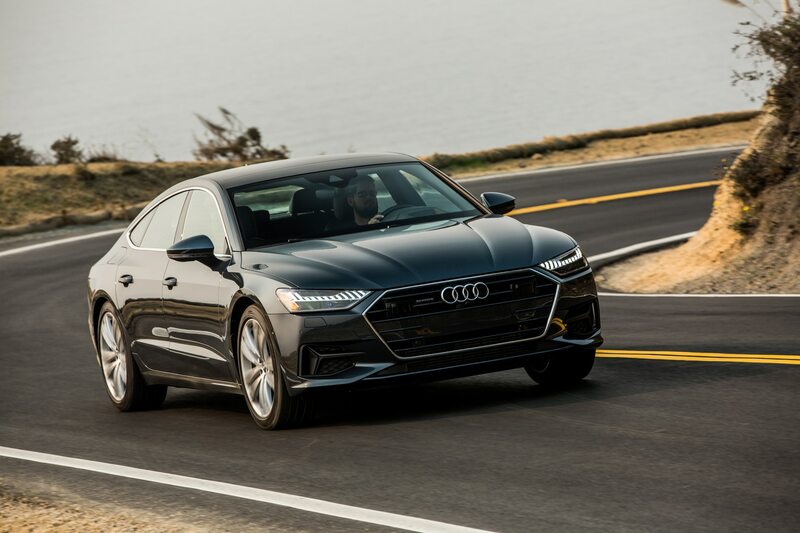 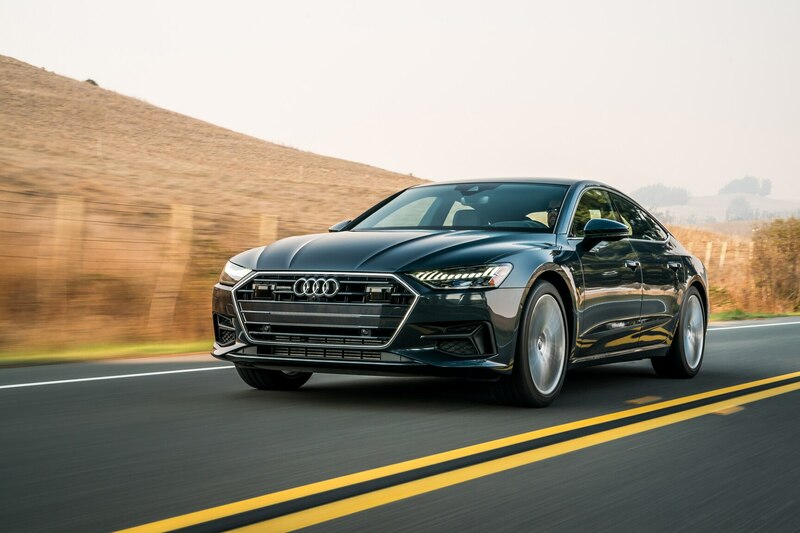 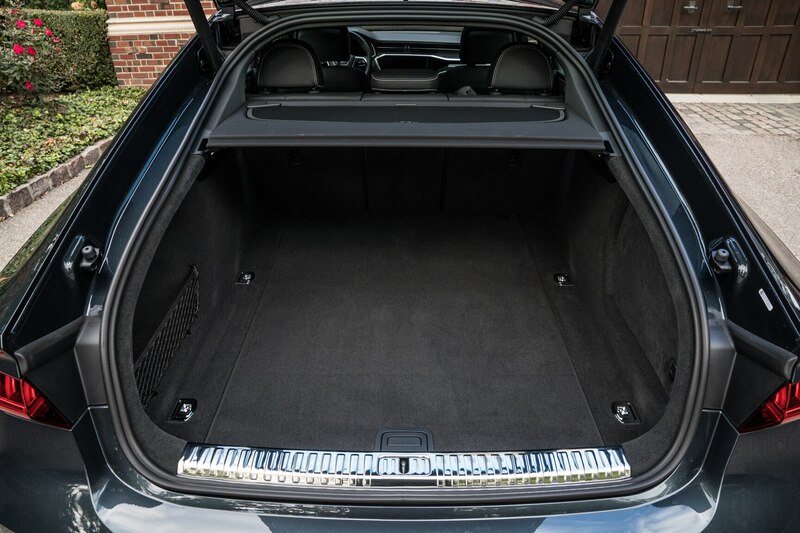 We searched in vein for the same function on the new, 2019 Audi A7, which by its sleek “four-door coupe” sheetmetal is explicitly a driver’s car. 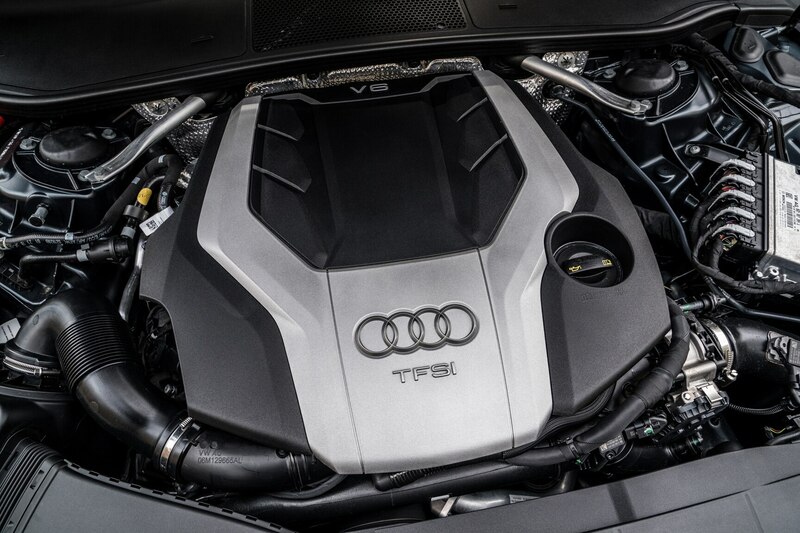 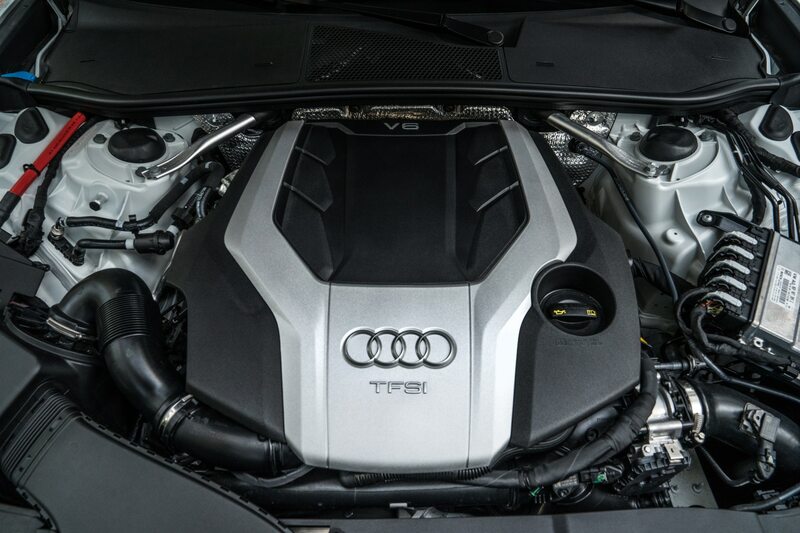 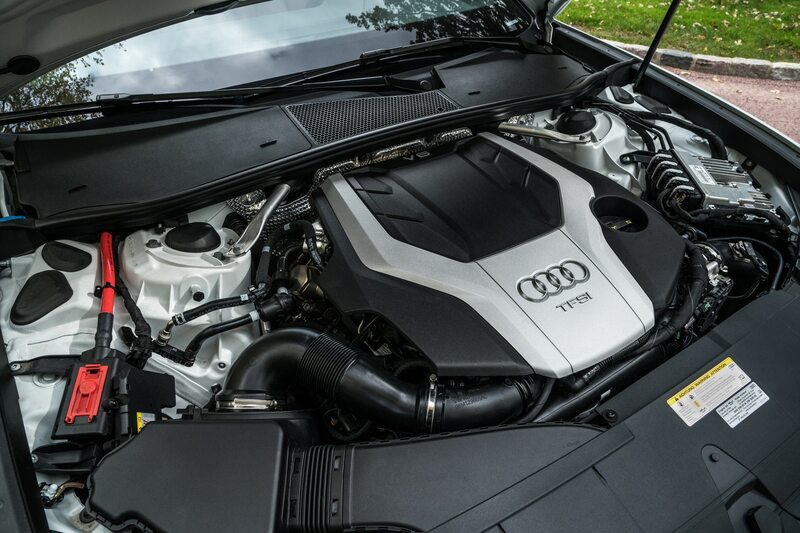 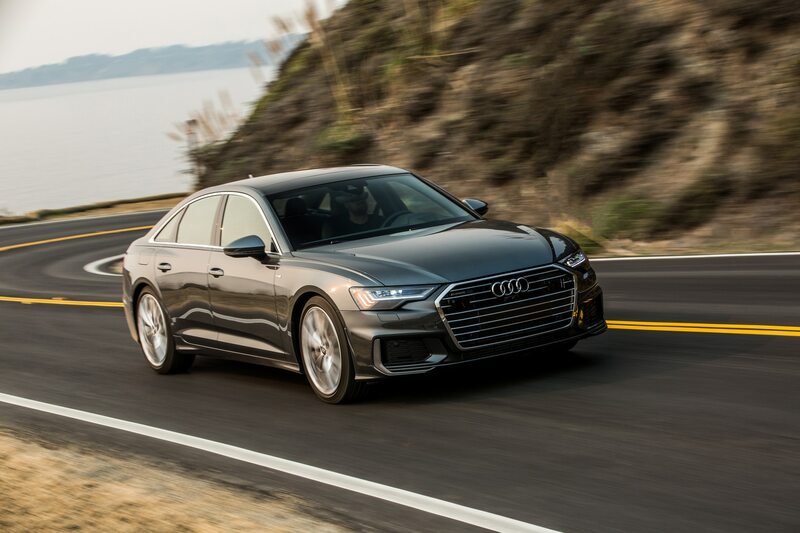 Under the new sheetmetal, the Audis A6 and A7 are essentially identical, powered by a new 3.0-liter turbocharged V-6 replacing the old supercharged 3.0, with a new 48-volt electrical system, all coupled to the Volkswagen Group’s familiar seven-speed dual-clutch automatic (except this transmission didn’t feel quite so familiar, because it is far smoother than when used in other applications). 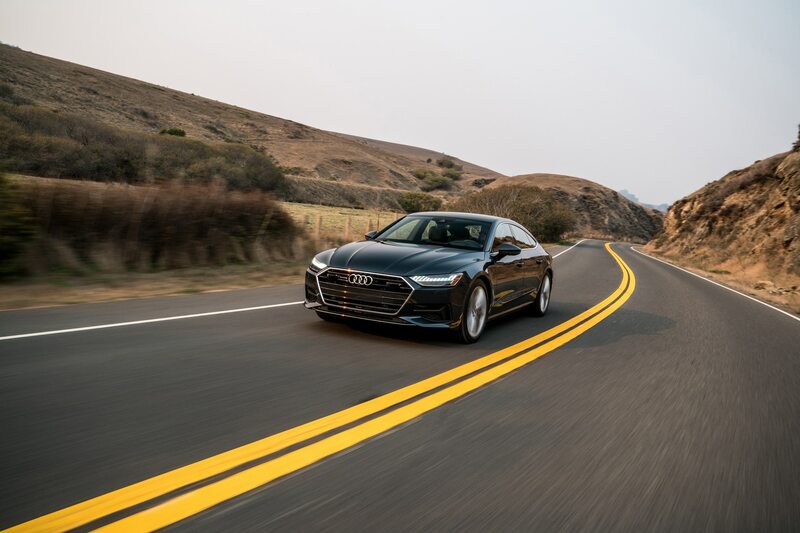 Thanks to the A7’s four-door hatchback body’s slight weight gain over the conventional A6 sedan, Audi claims a 0.1-second deficit in the 0-60 sprint for the driver’s version. 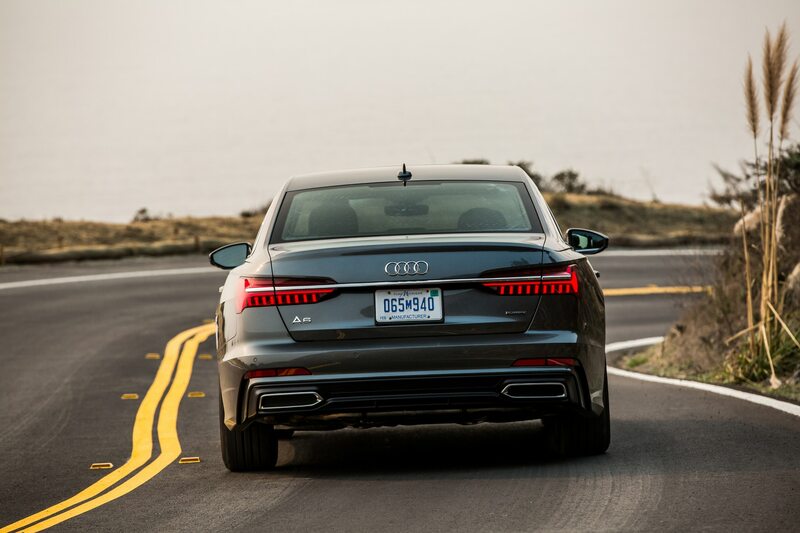 We drove the Audi A6 first, out of San Francisco up through the Mayamaca and Vaca mountain ranges to Napa Valley. 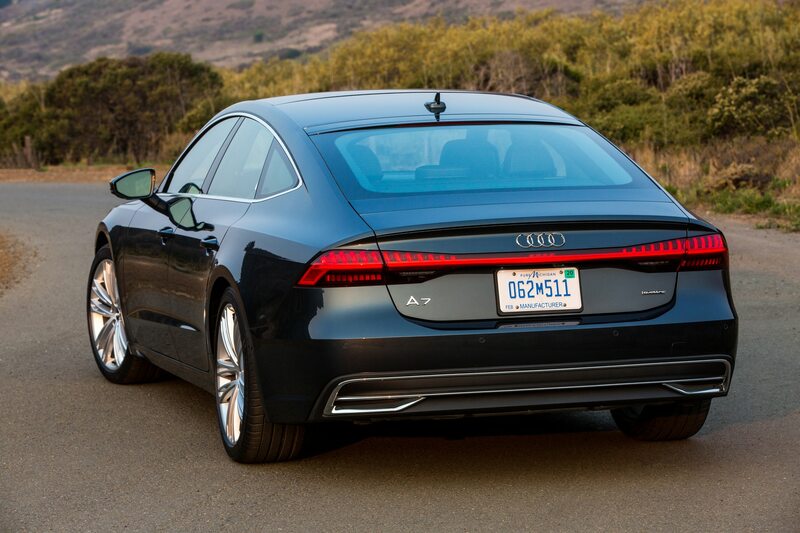 The next day, we drove the Audi A7, circulating through the wineries and vineyards of Napa Valley. 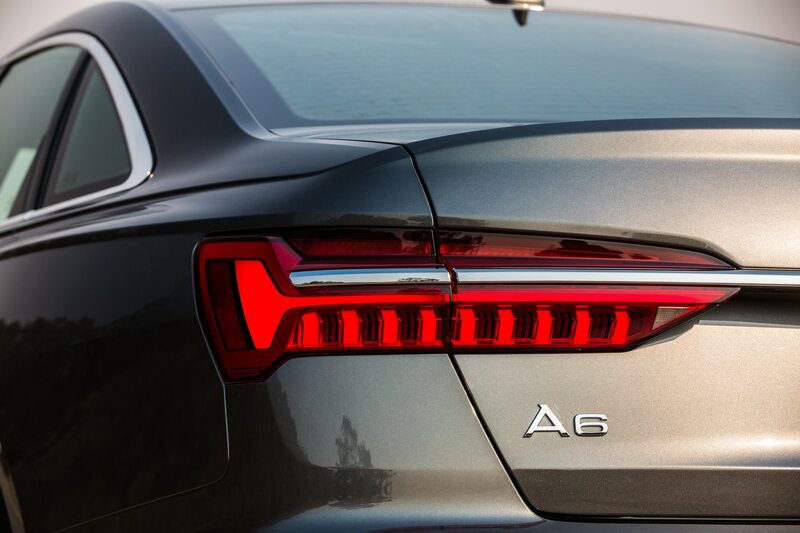 As it turns out, the A6 got a more spirited drive because of slightly lighter traffic. 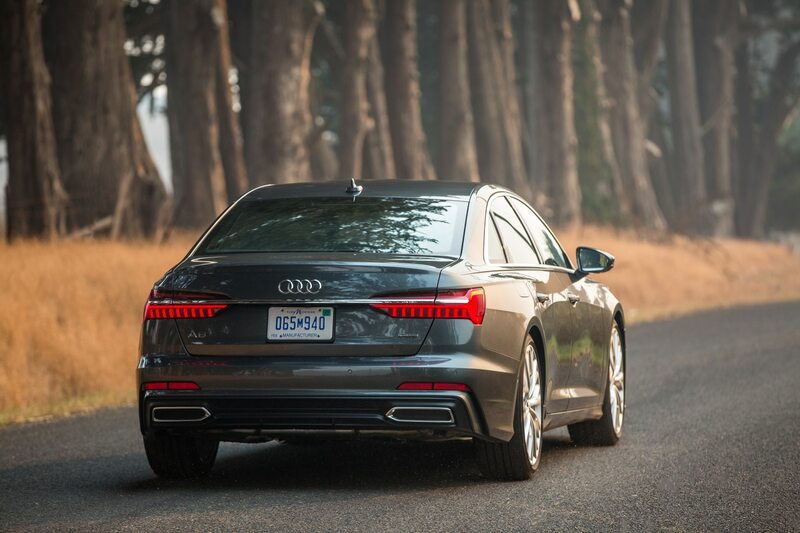 The upshot is that you can’t tell the difference between the two cars in a blindfold test, until you ram into a redwood. 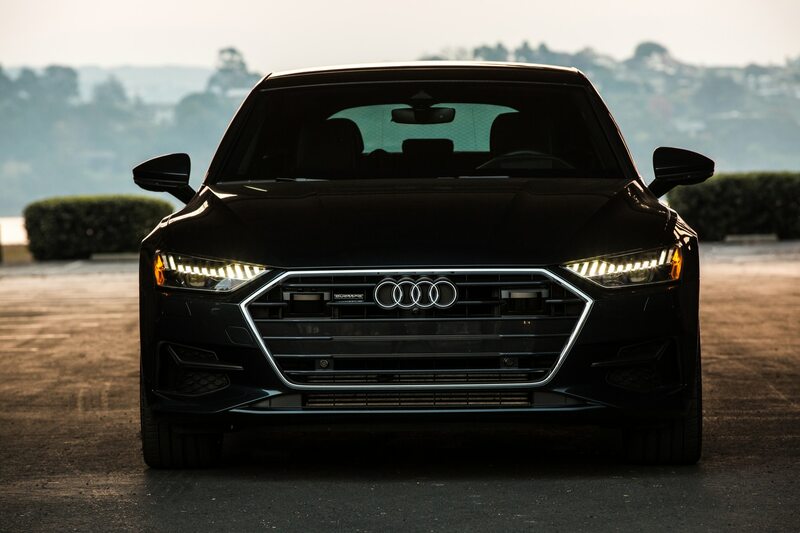 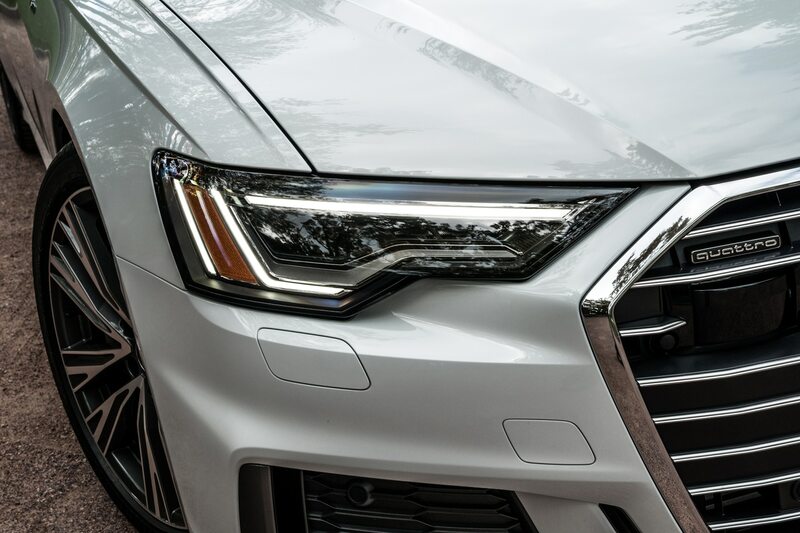 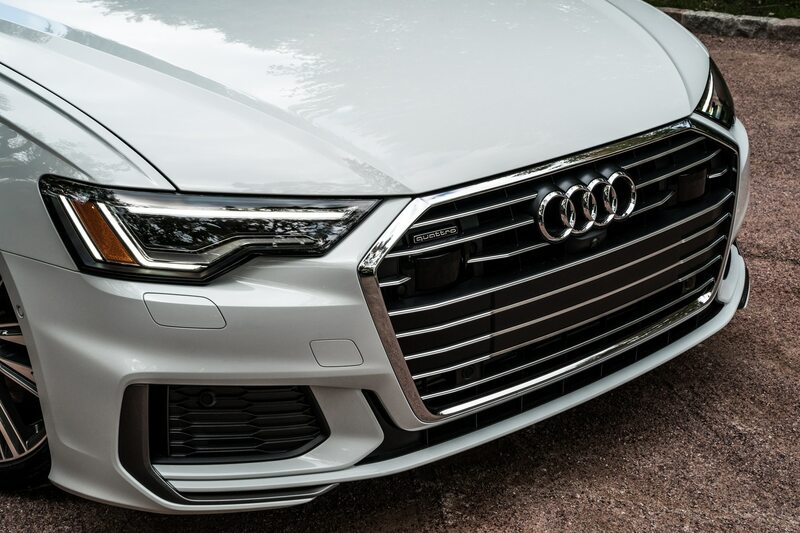 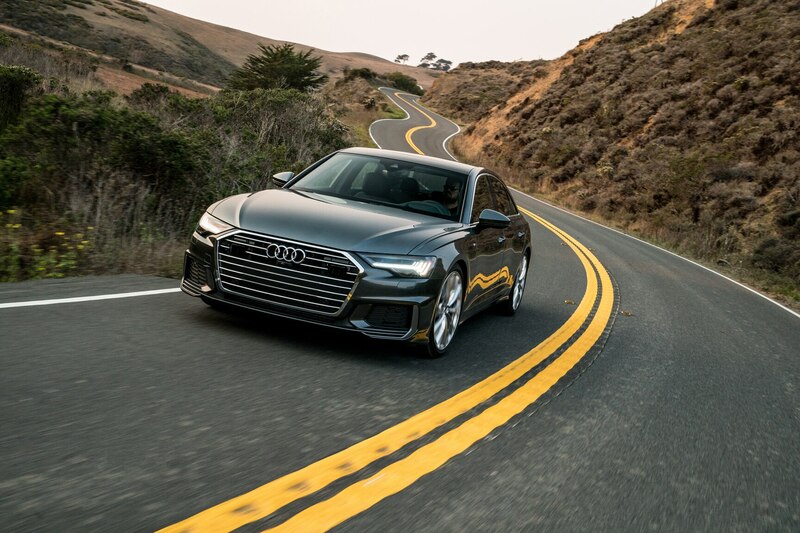 The Audi A6 retains its conservative, more upright bodystyle with its conventional sedan trunk, but with the latest Audi grille, reworked sheetmetal and new trick lighting with LEDs and laser-enhanced headlamps. 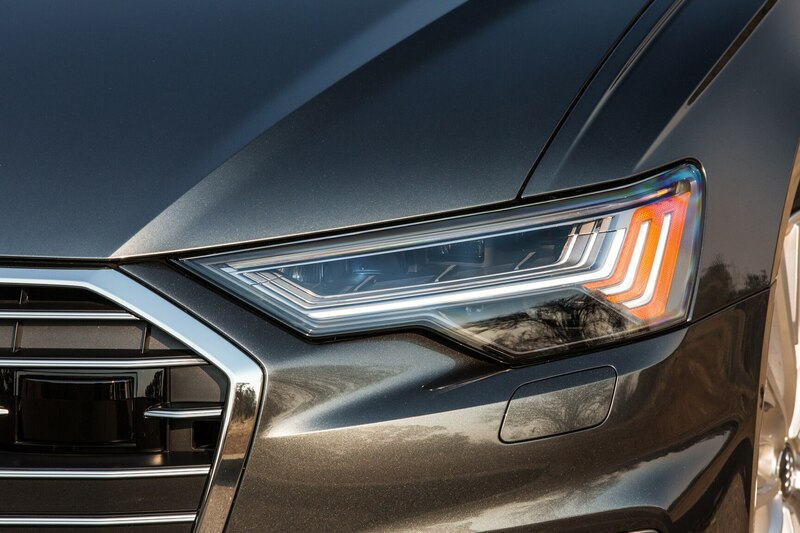 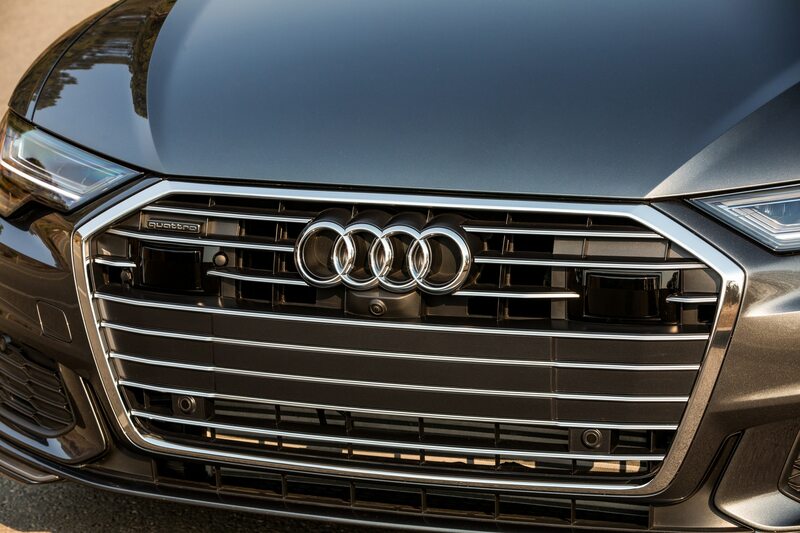 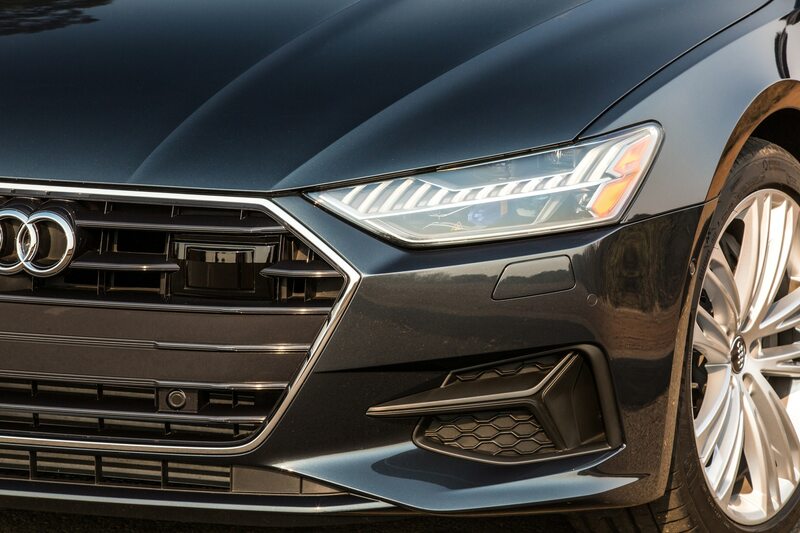 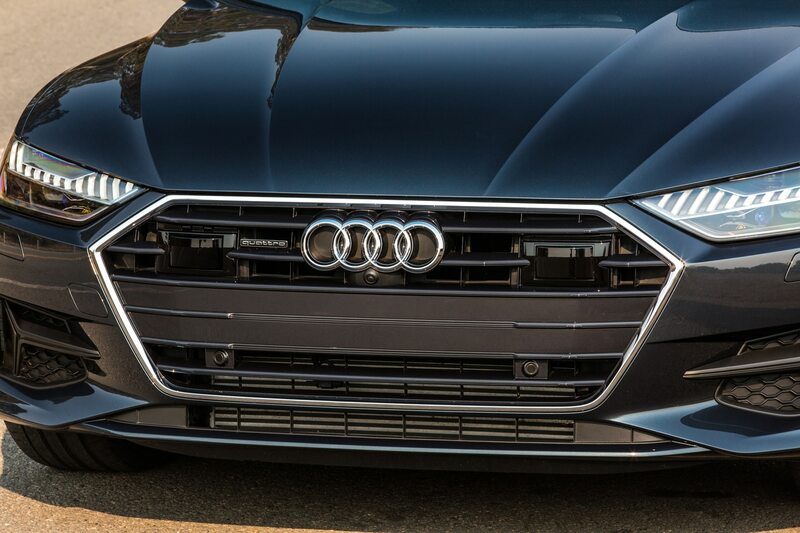 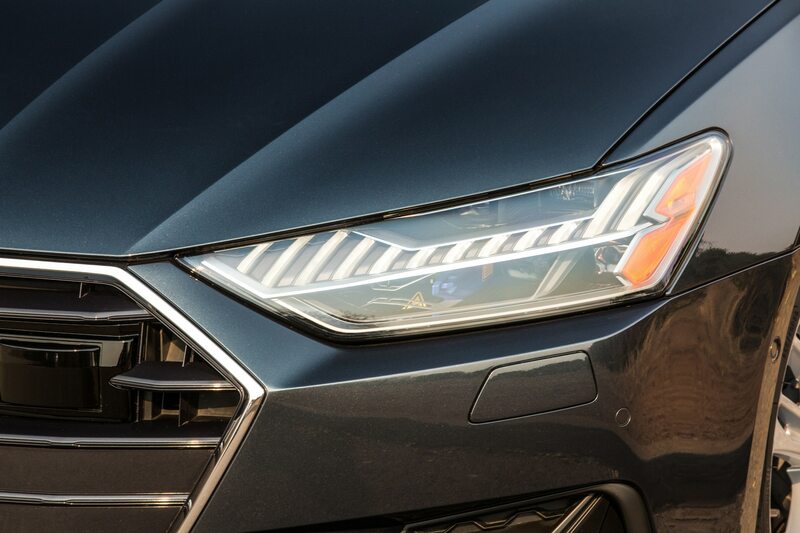 The A7 has those headlamps and LEDs, too. 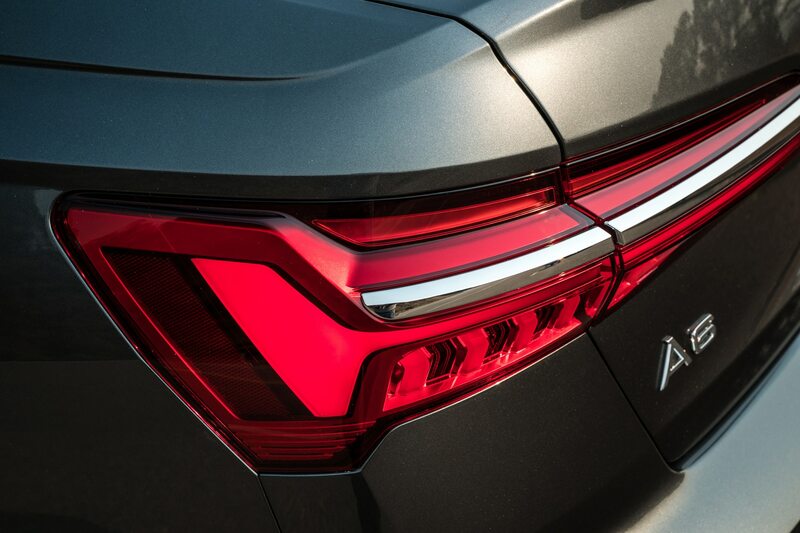 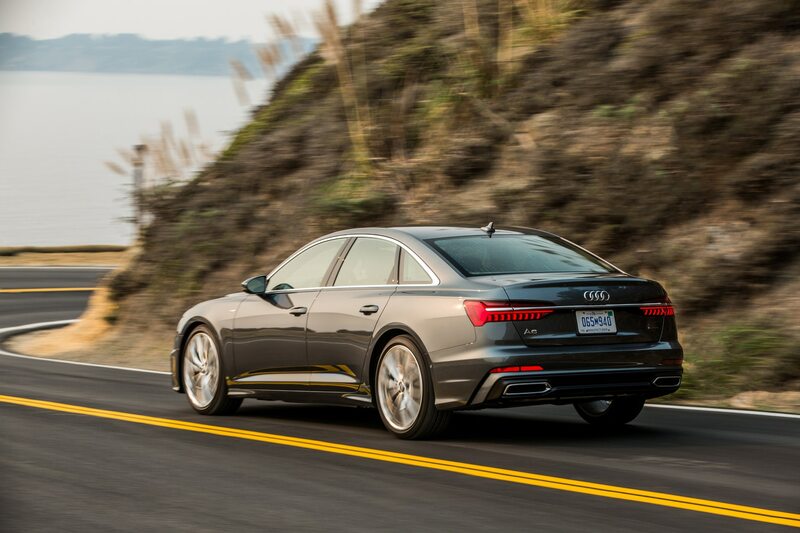 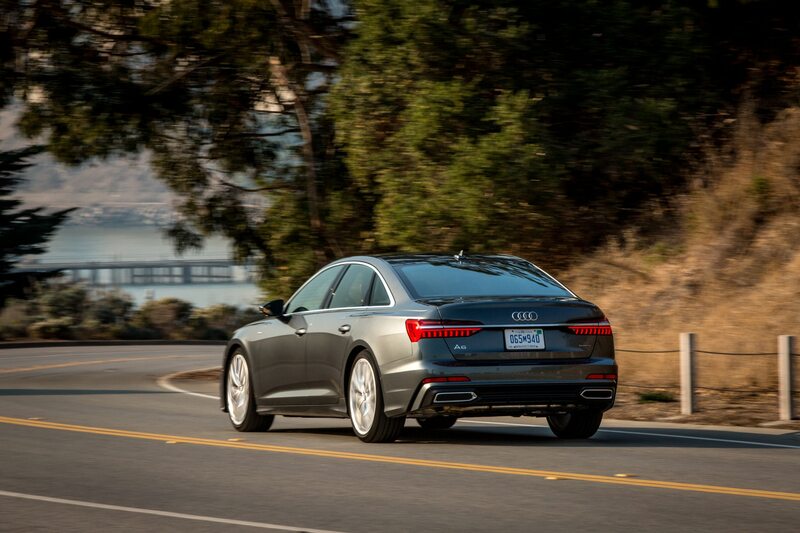 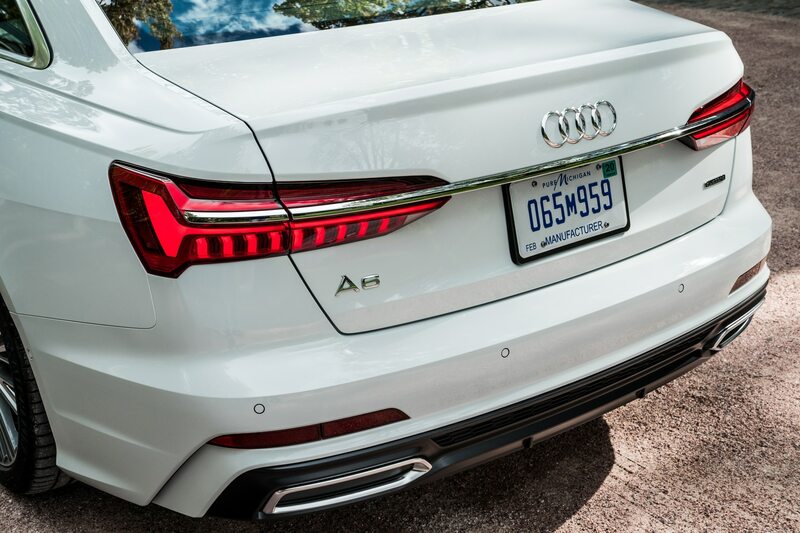 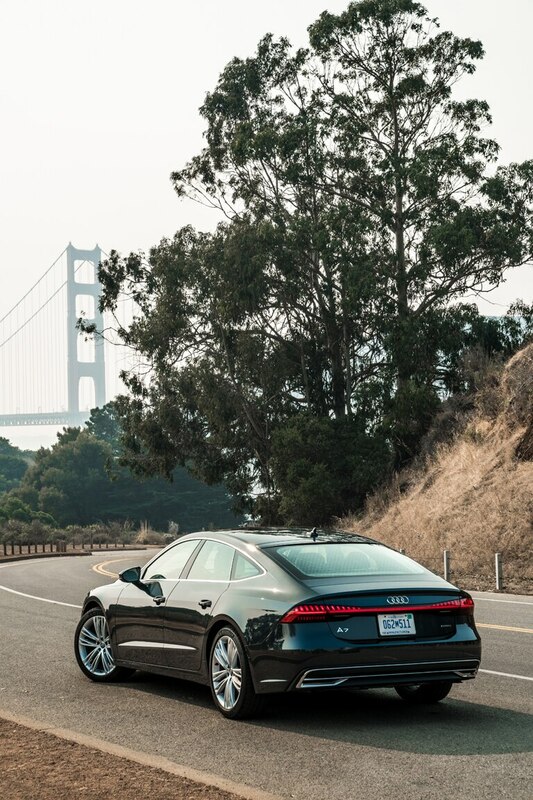 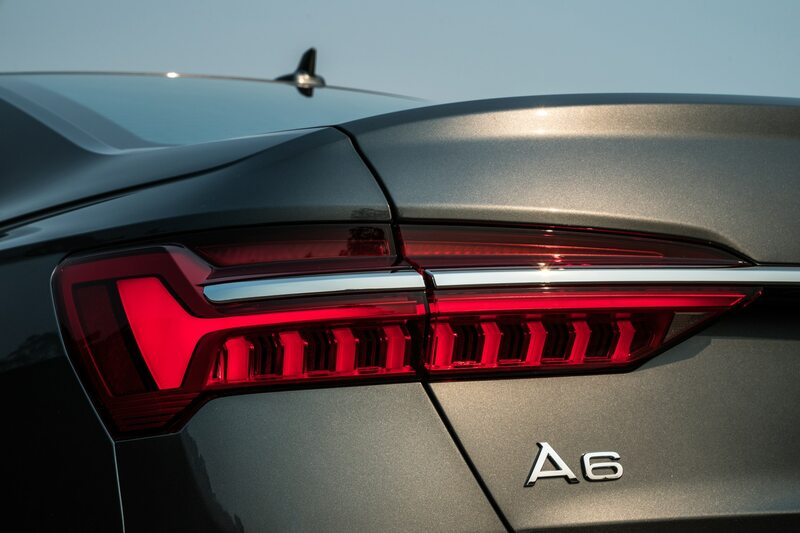 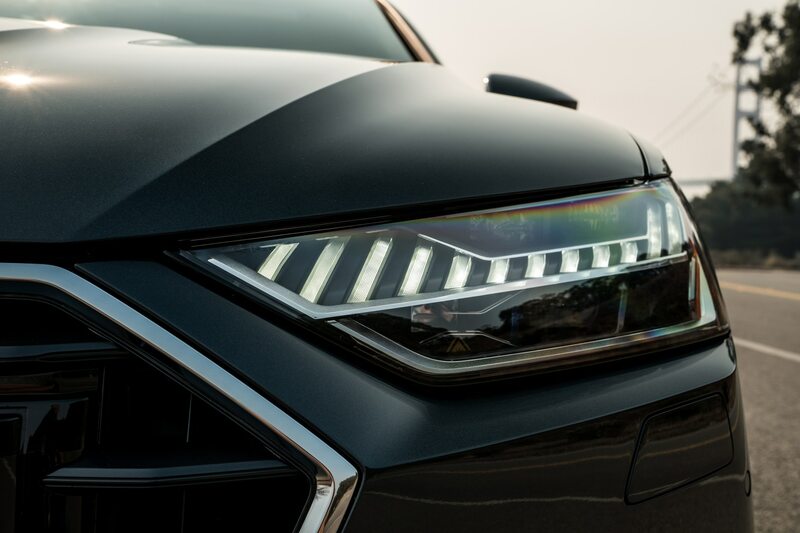 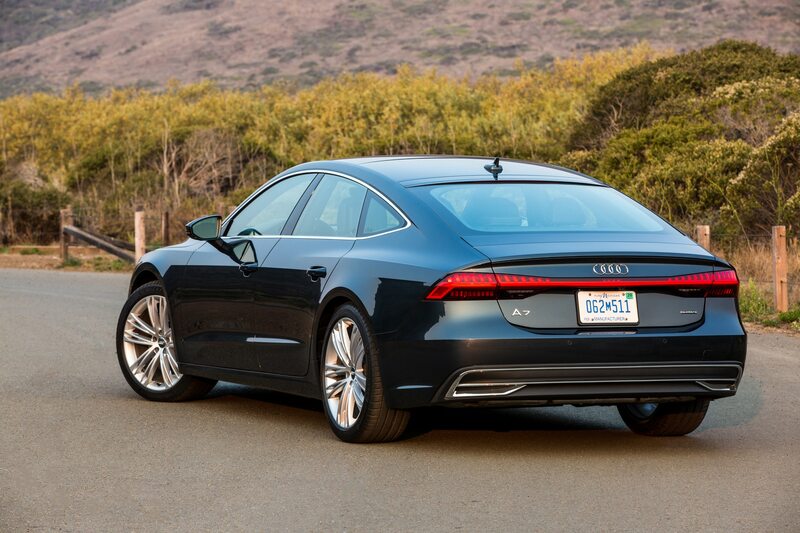 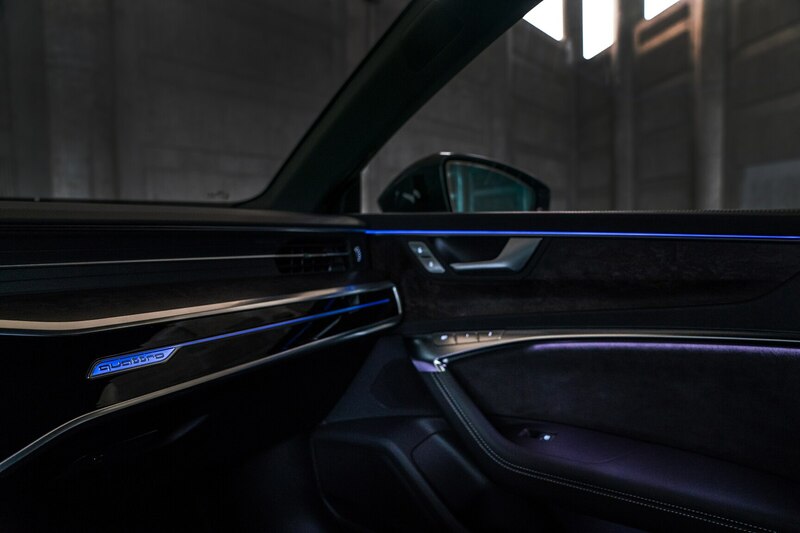 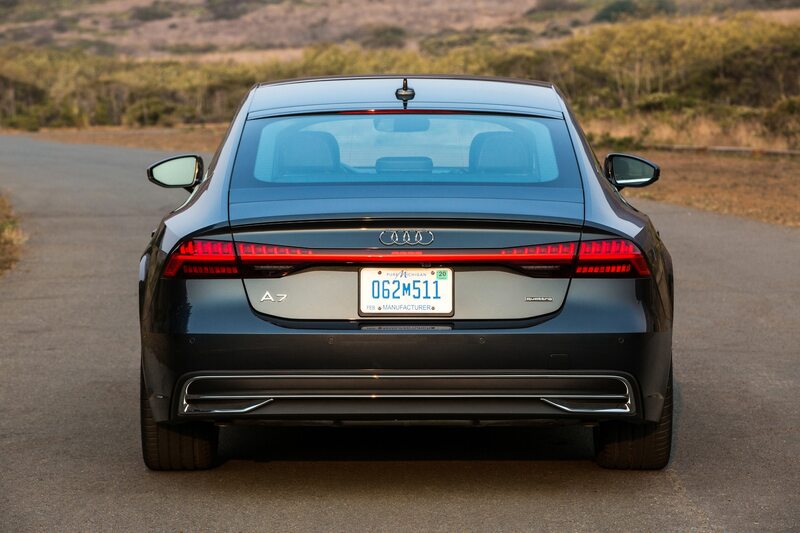 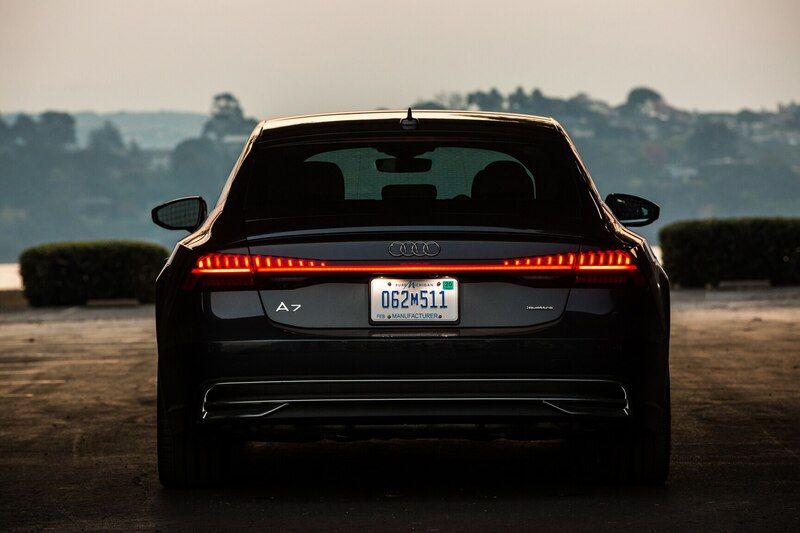 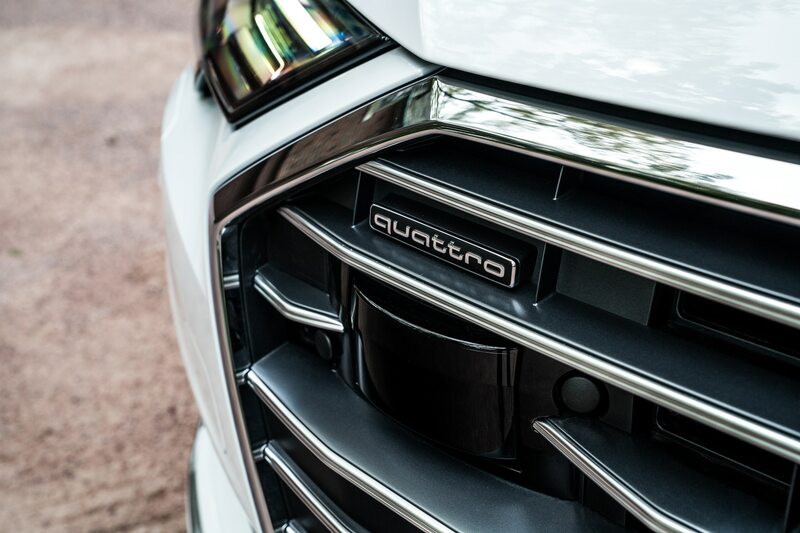 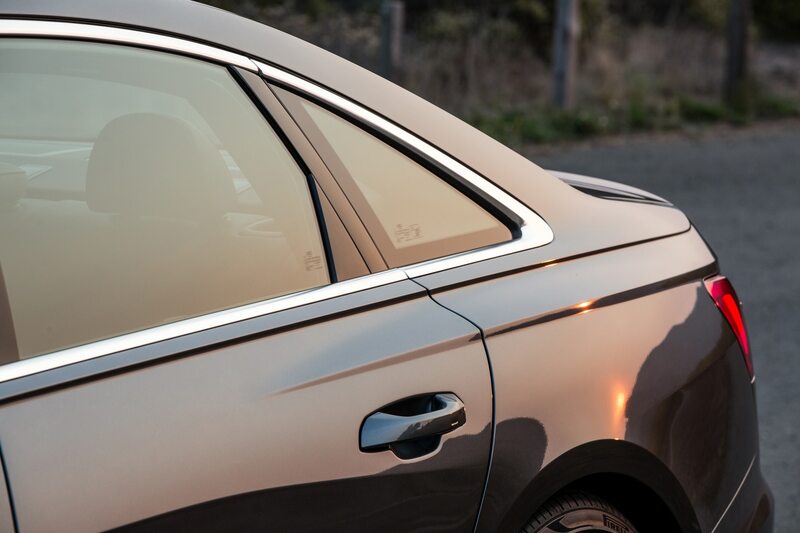 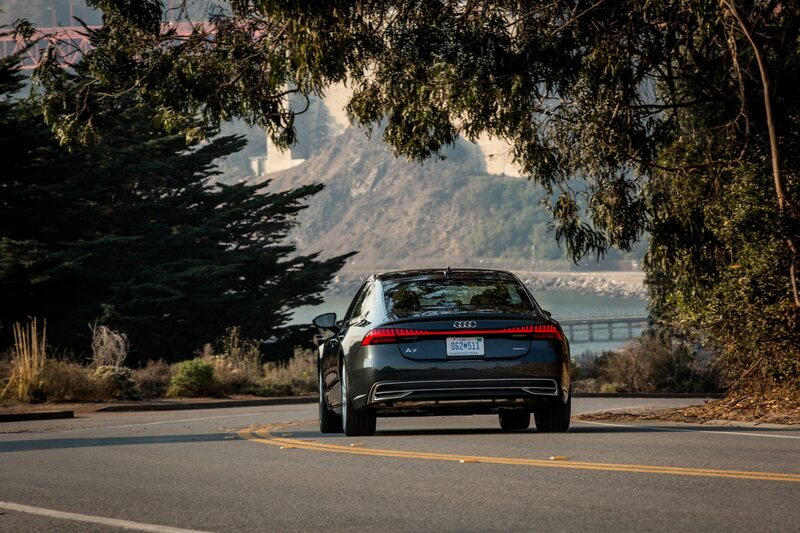 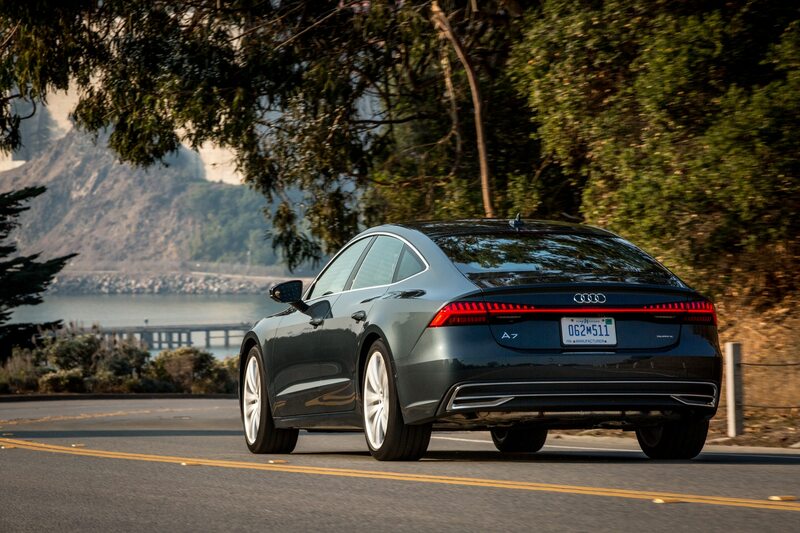 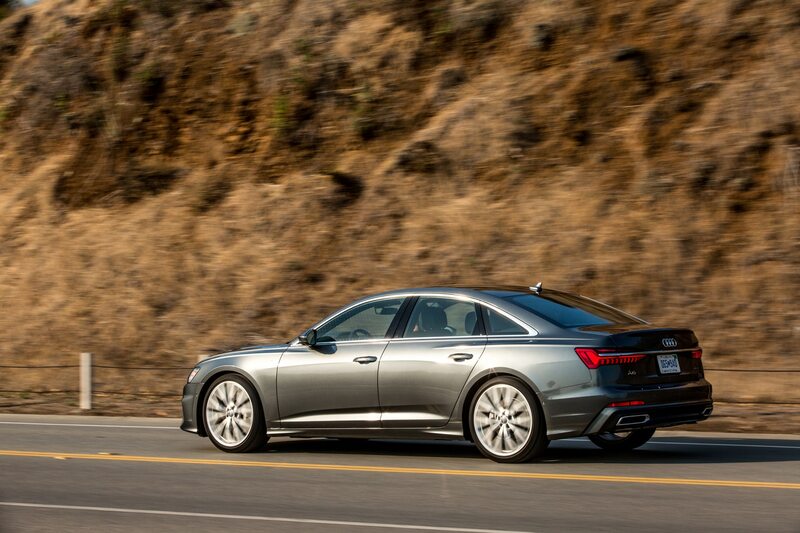 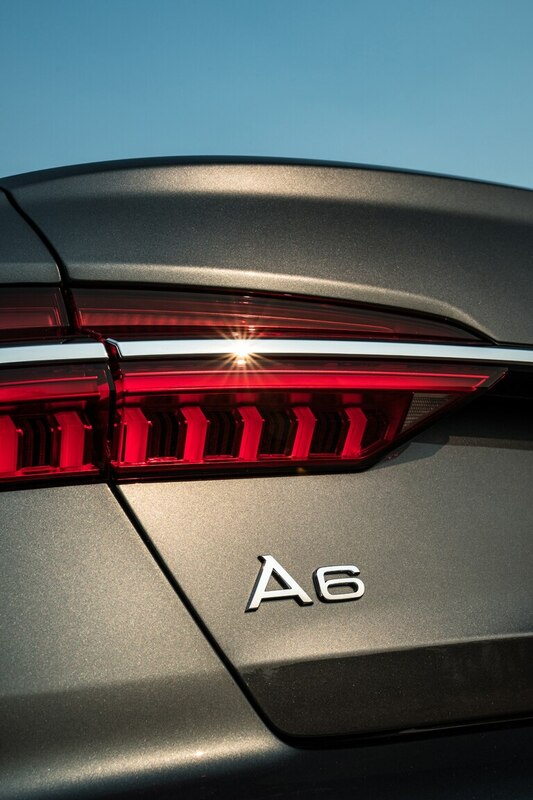 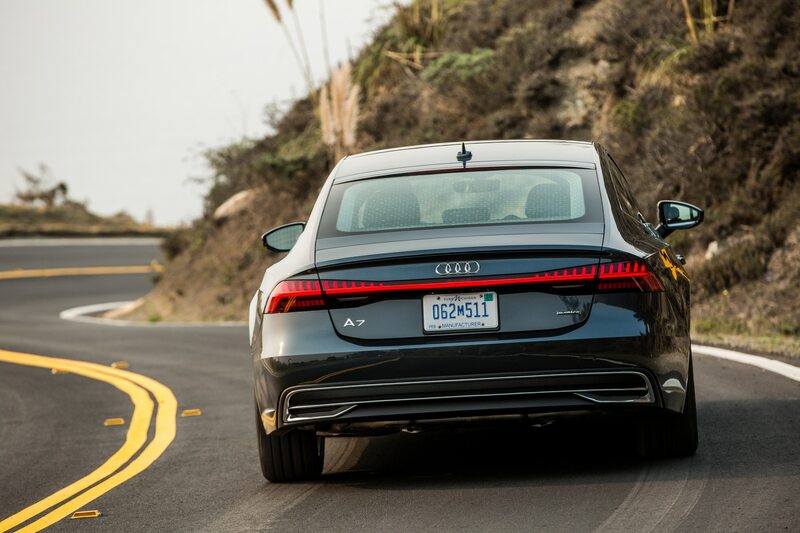 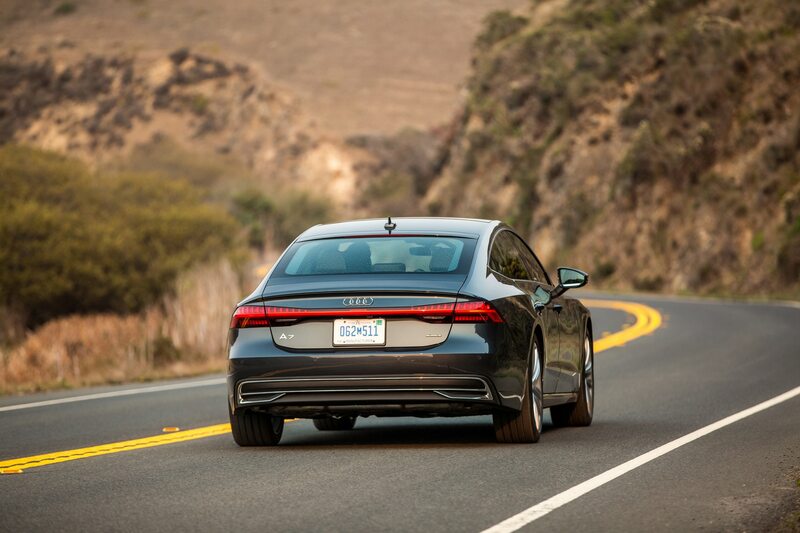 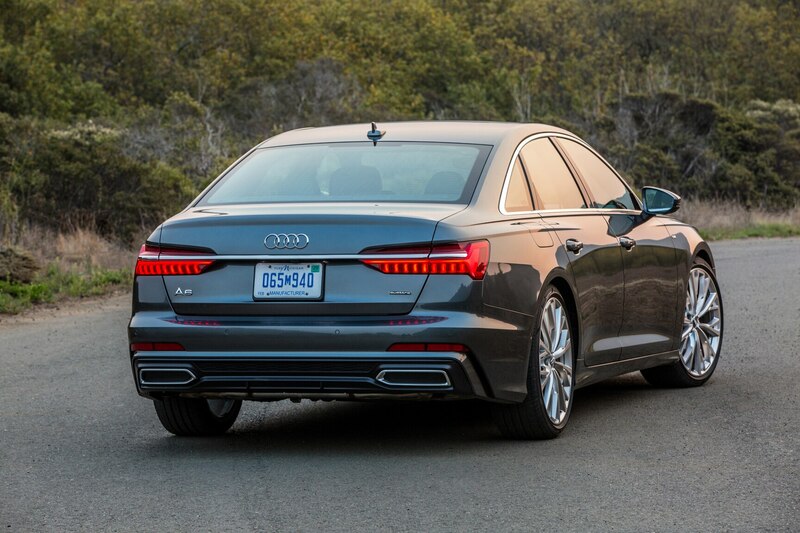 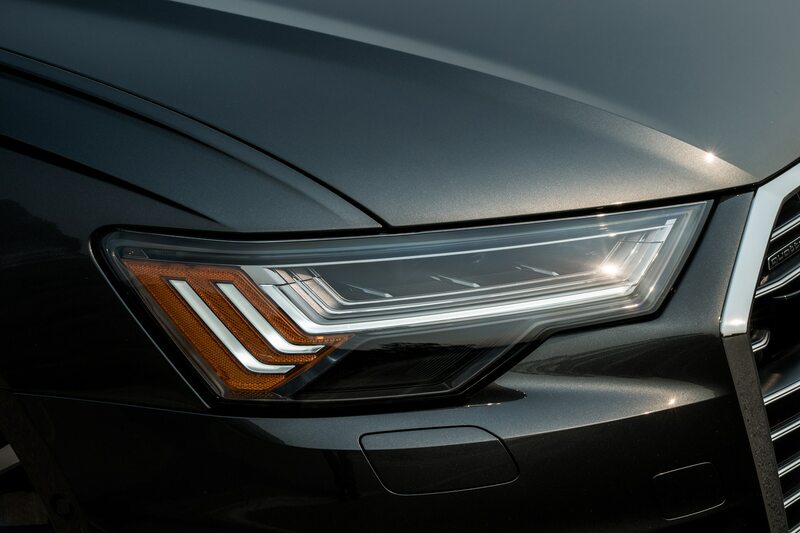 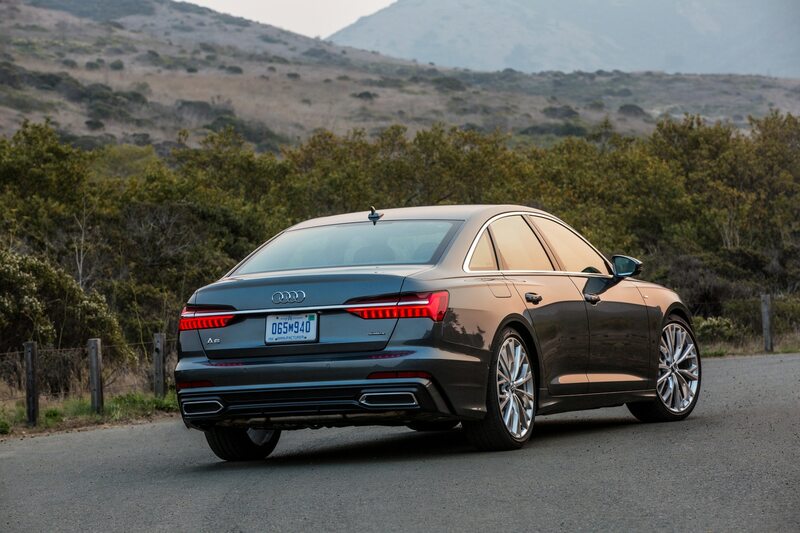 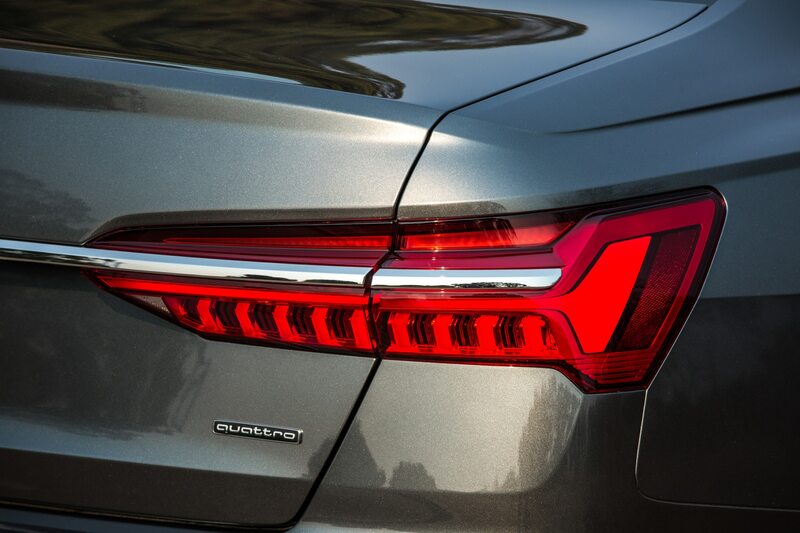 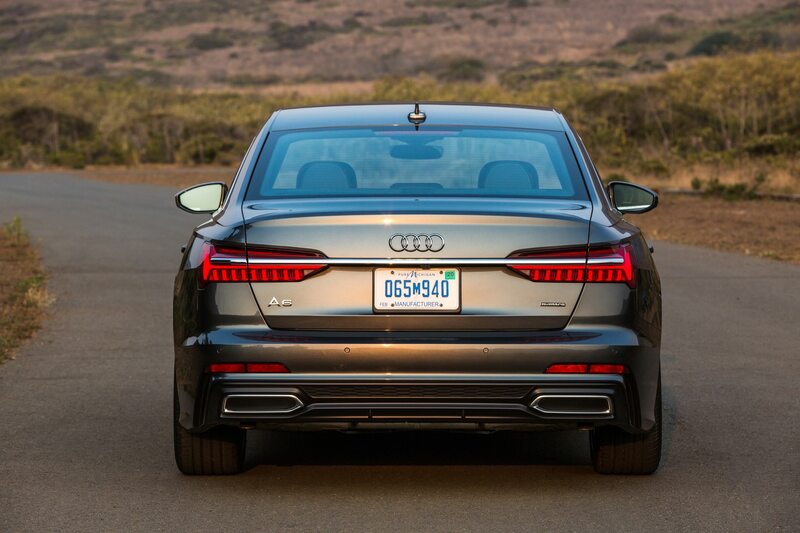 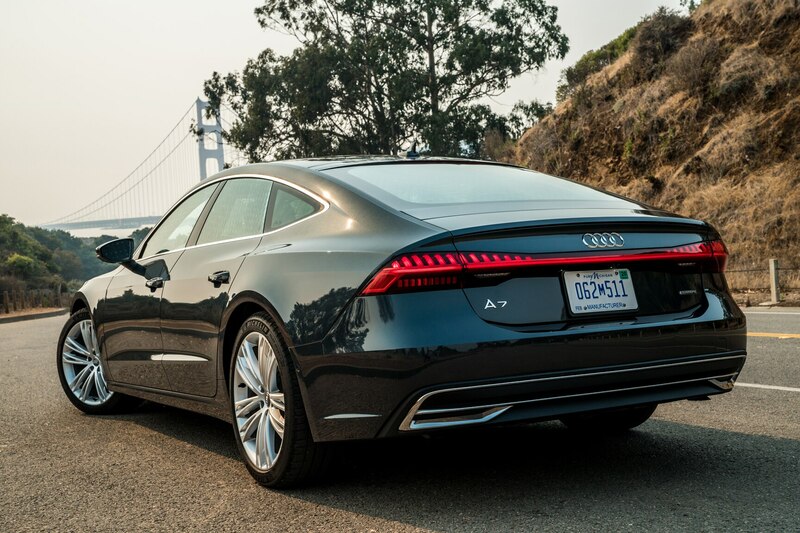 While the A6’s taillamps are visually connected by a chrome strip under the rear deck’s four-ring badge, the A7 foregoes the horizontal chrome strip in favor of a one-piece taillamp bar covering the width of the deck. 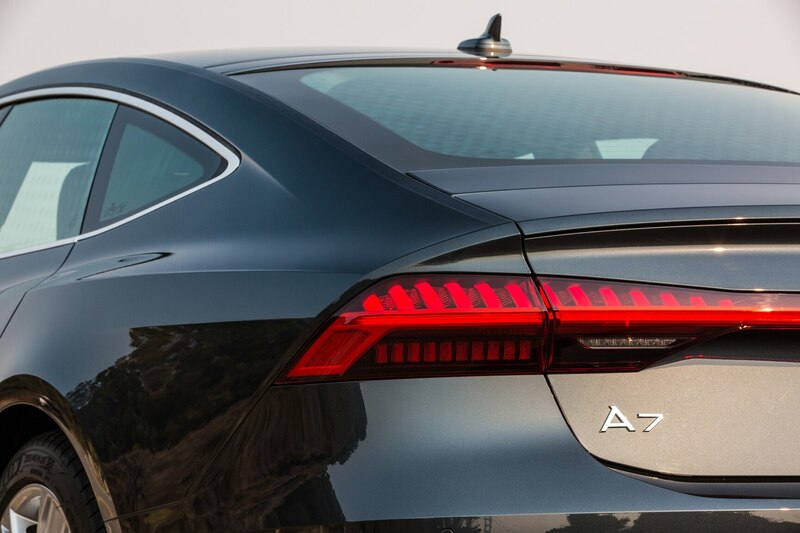 There’s a tricky-to-stamp cove between the taillamps and with the spoiler lip, the rear deck will surely make you think “four-door Lamborghini Huracan” from the rear three-quarter view. 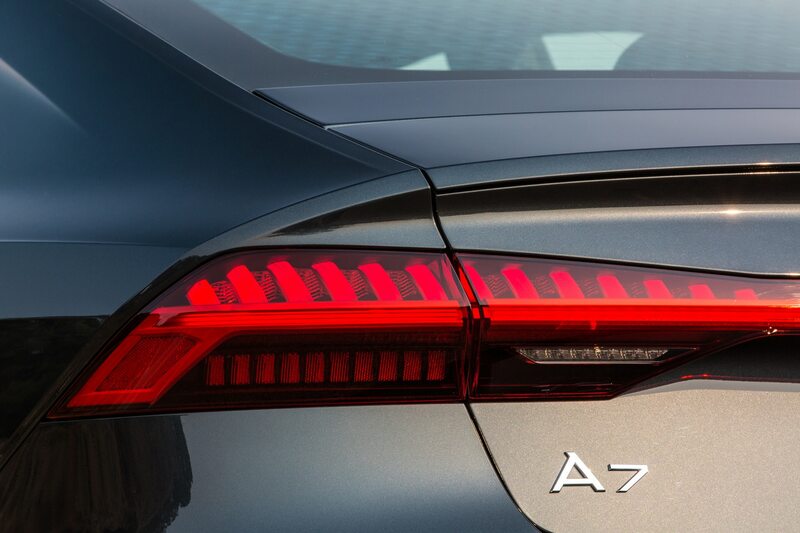 The Audi A7’s profile is expressive with character lines, and the rear deck now is 33mm higher than the Mark I A7 it replaces, solving the “droopy decklid” look many of us criticized in that car. 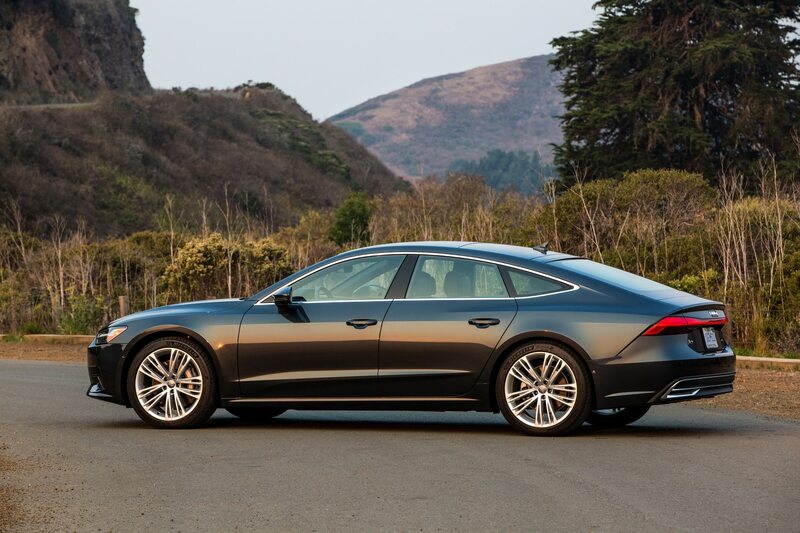 It’s very handsome, with a subtly upswept beltline that visually speeds up the fastback roofline, while maintaining a semblance of rear-seat headroom. 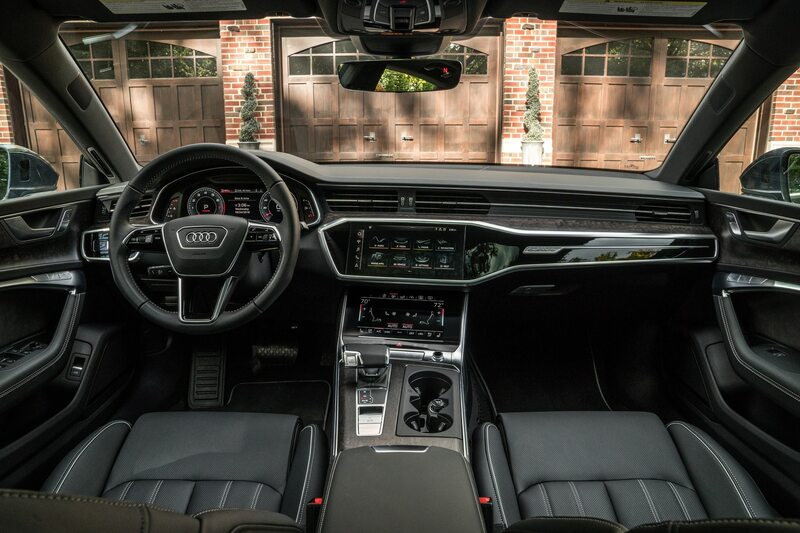 There’s noticeably less headroom than in the A6, with the hair atop my five-foot 11-inch tall body tickling the headliner. 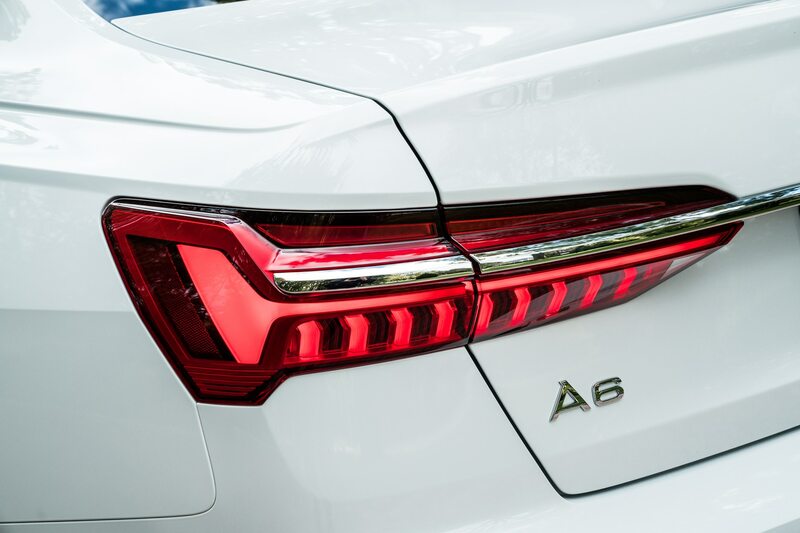 I cycled through the “comfort” and “dynamic” modes on the haptic-buttoned driver’s settings and found I really like either the A6 or A7 in “comfort”, because there’s a slight bit of compliance in the corners. 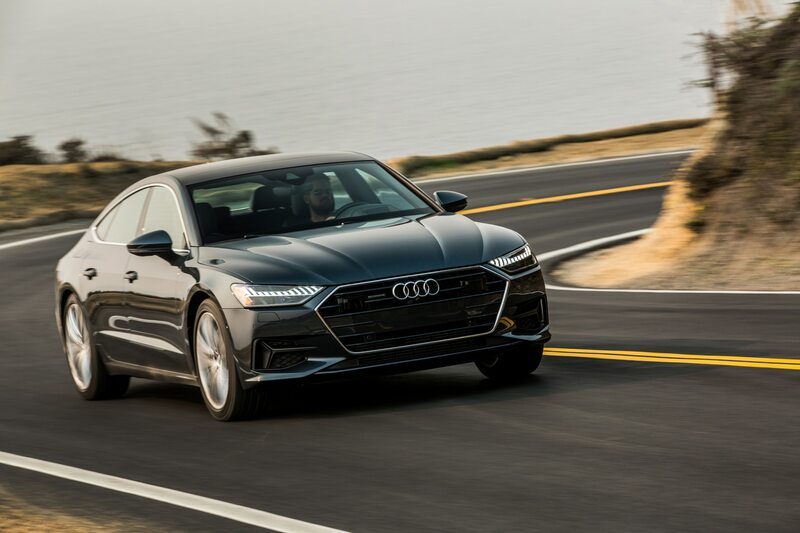 It adds to the feedback, nicely enhancing the communicative steering, although it is slightly less willing to rotate, and the throttle response is less touchy, so there no more than a single heartbeat of lag when tipping into the throttle out of tight corners. 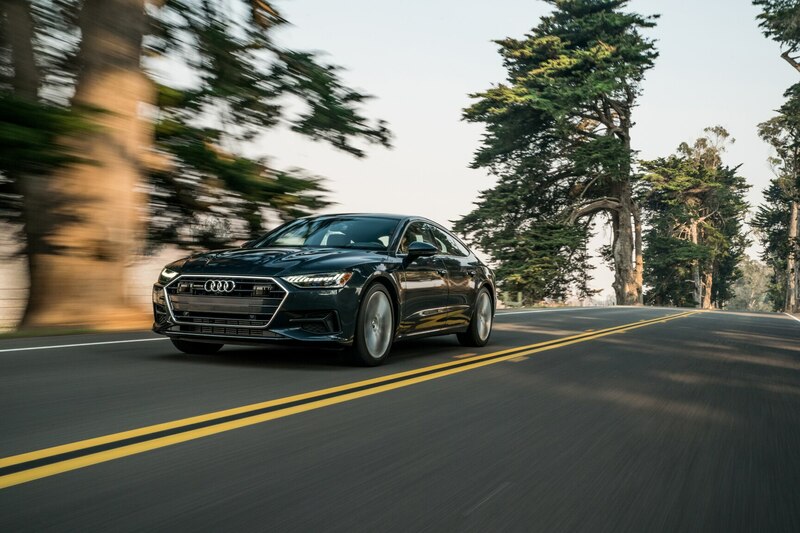 The 48-volt system is not designed to compensate—it’s only for smooth stop/start and the ever-growing list of electronic functions, and it shuts down the engine from 15 mph when you lift off the throttle. 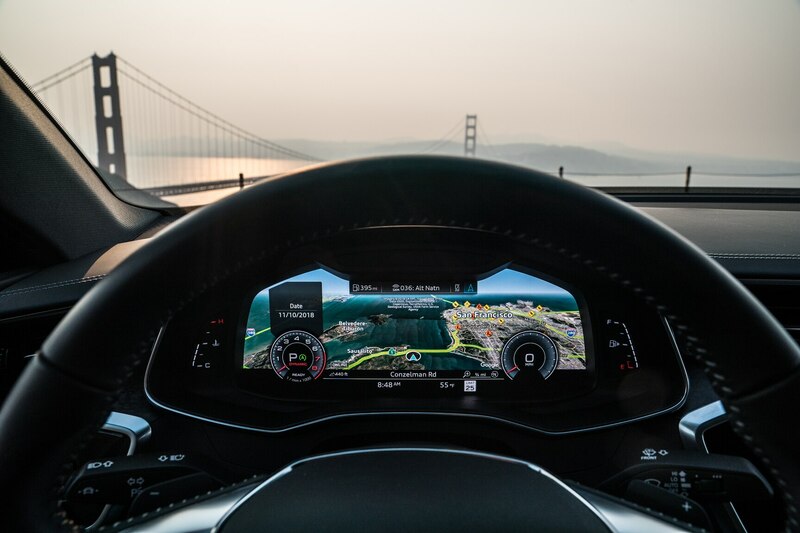 Dynamic mode stiffens up the cars to the point of no detectable yaw around such corners, and no detectable lag or hesitation from the throttle, except in the slowest, tightest of corners. 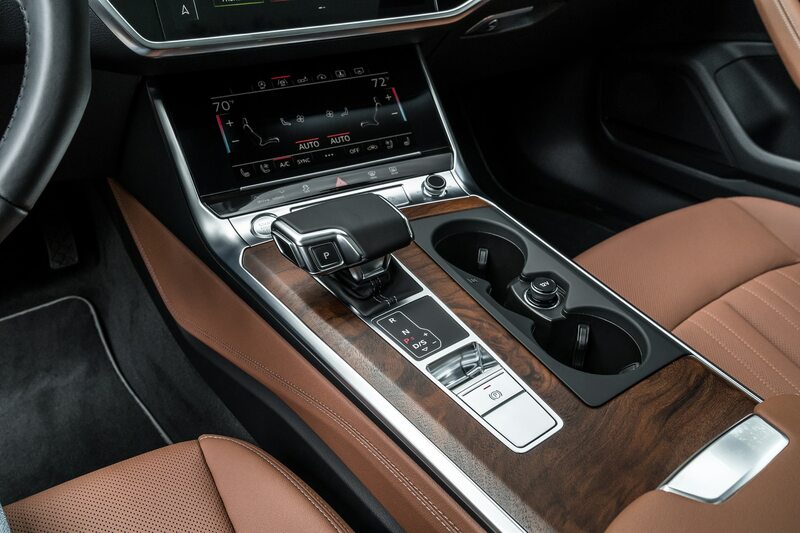 Manumatic control of the seven-speed helps a bit, and clicking the paddles of a DCT is much more satisfying than self-shifting an automatic. 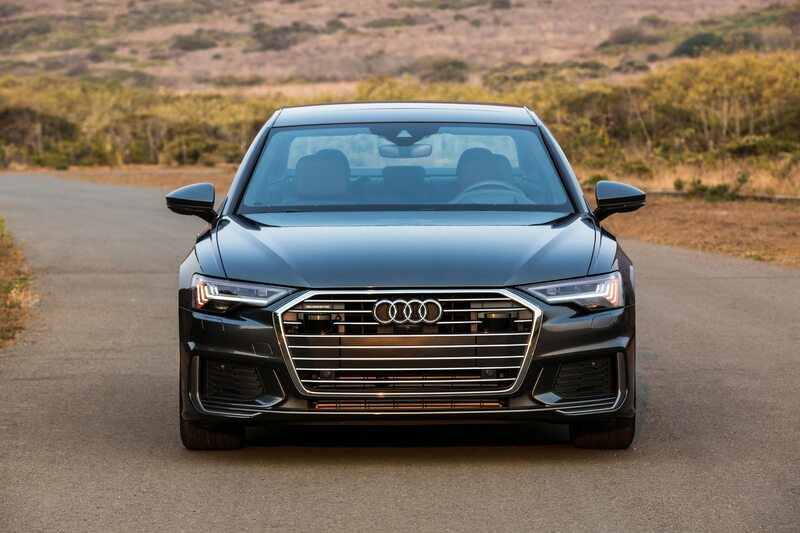 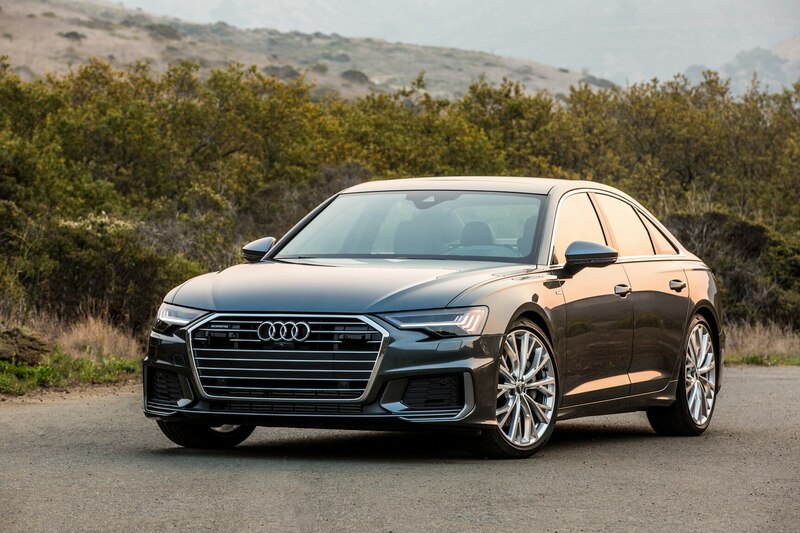 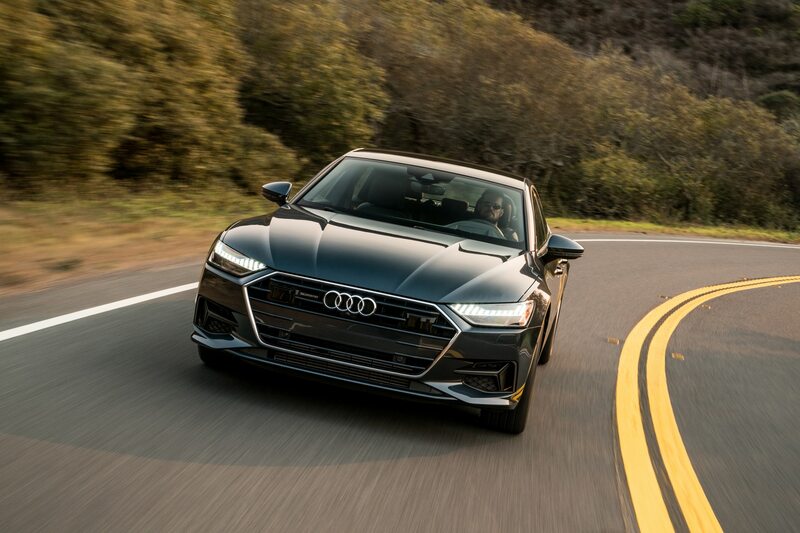 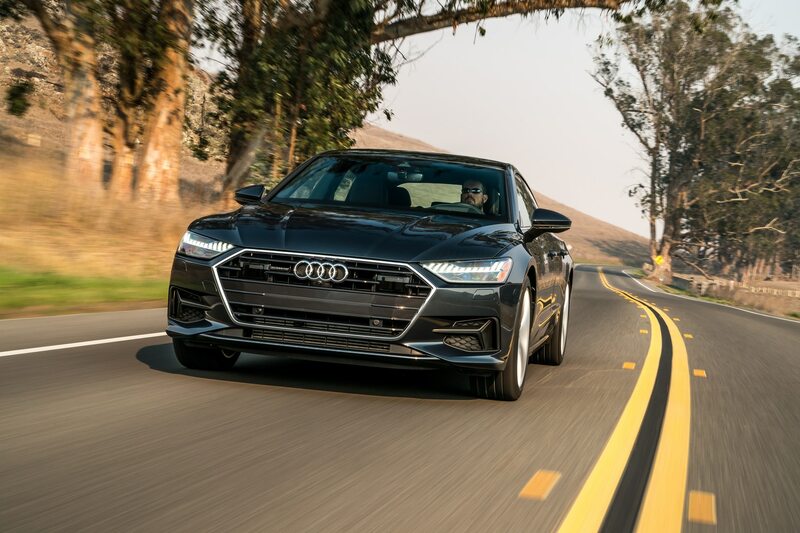 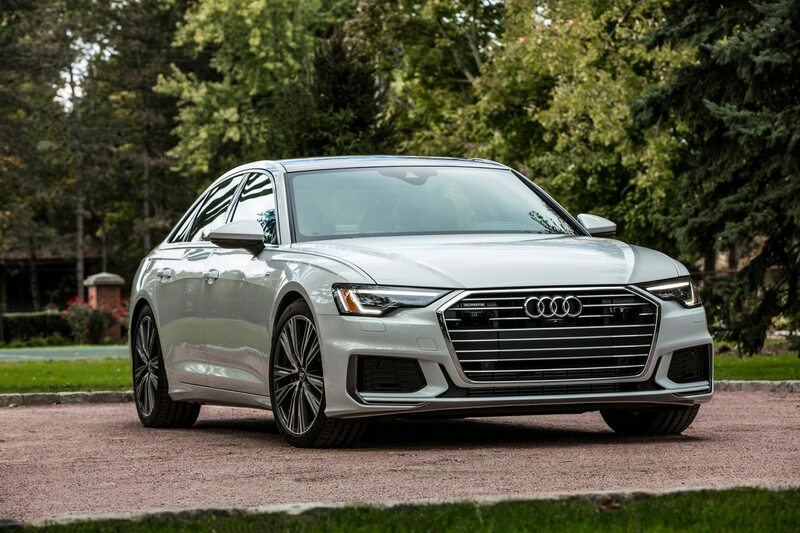 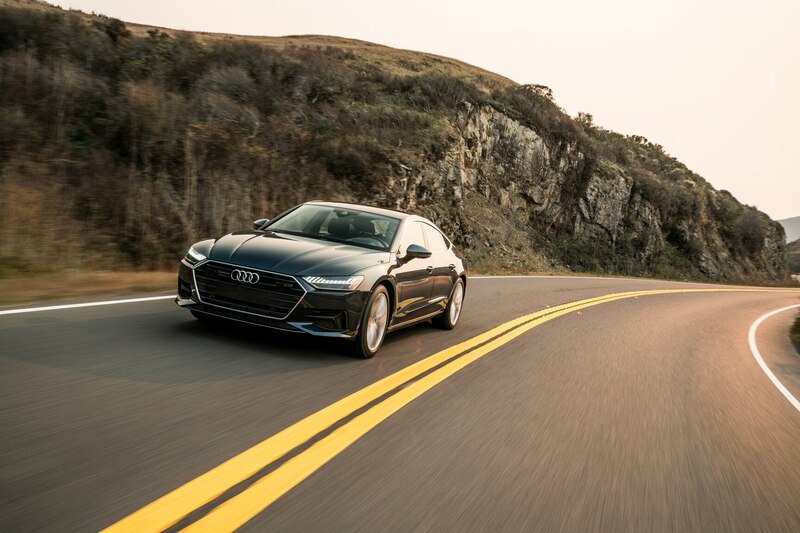 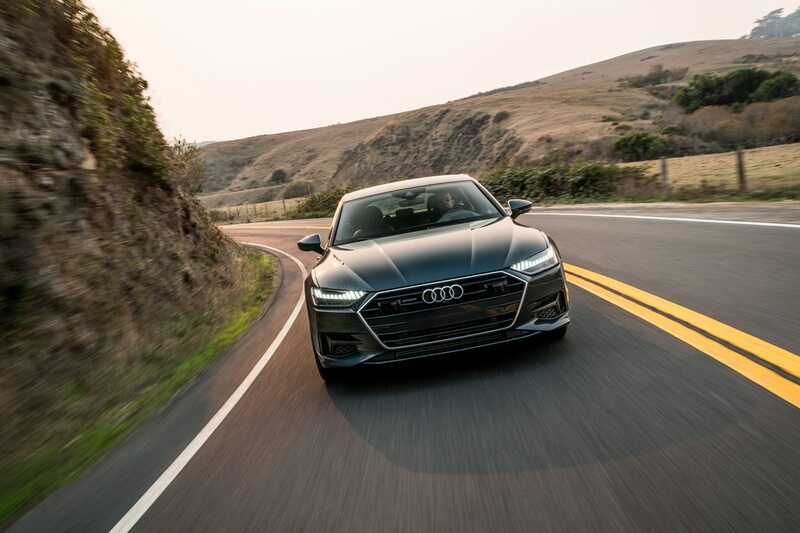 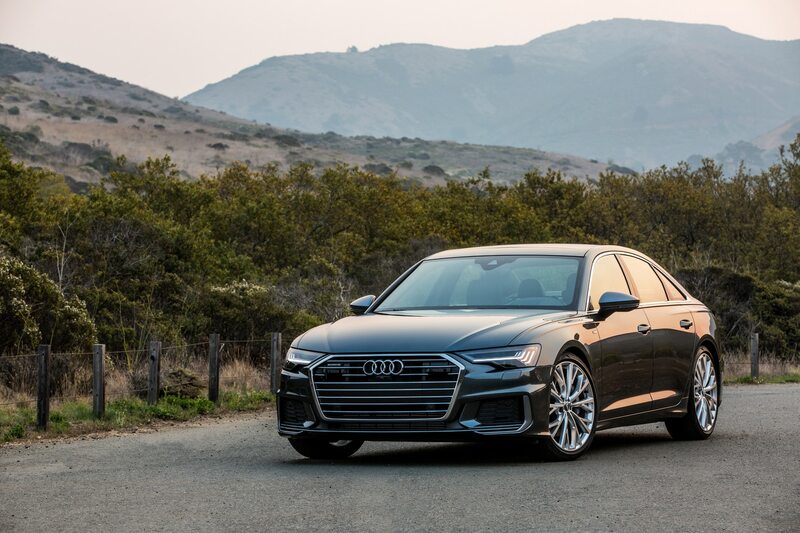 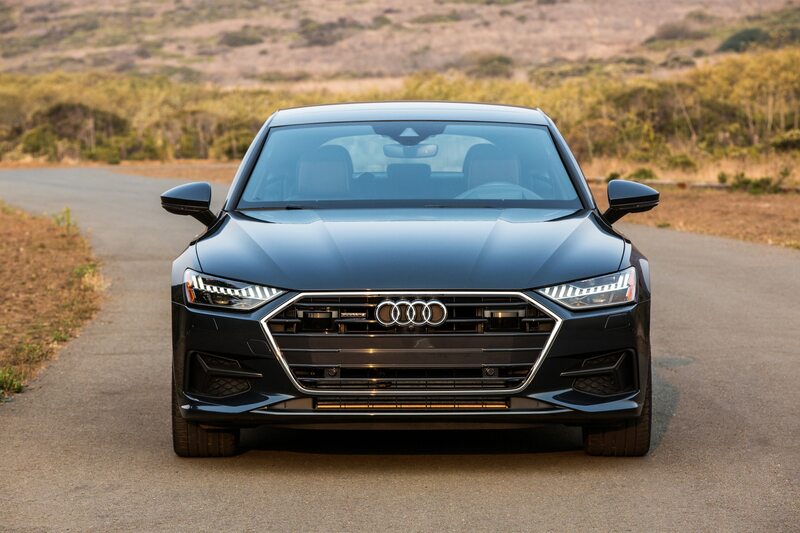 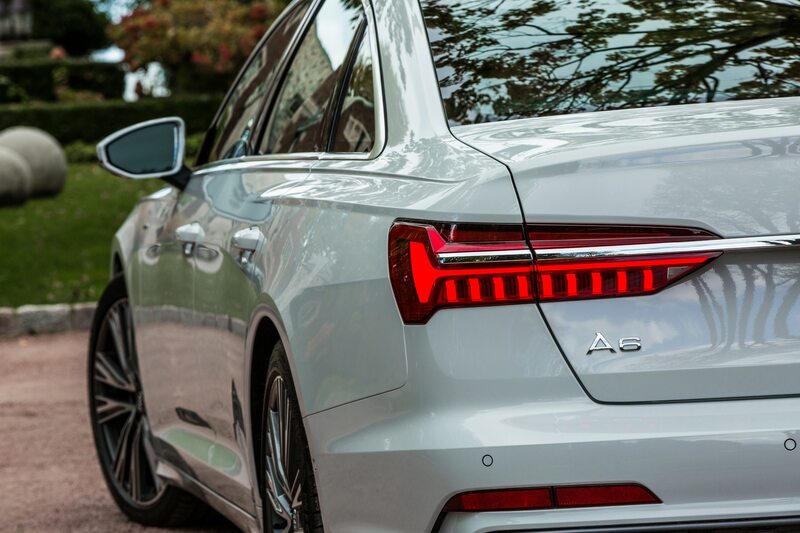 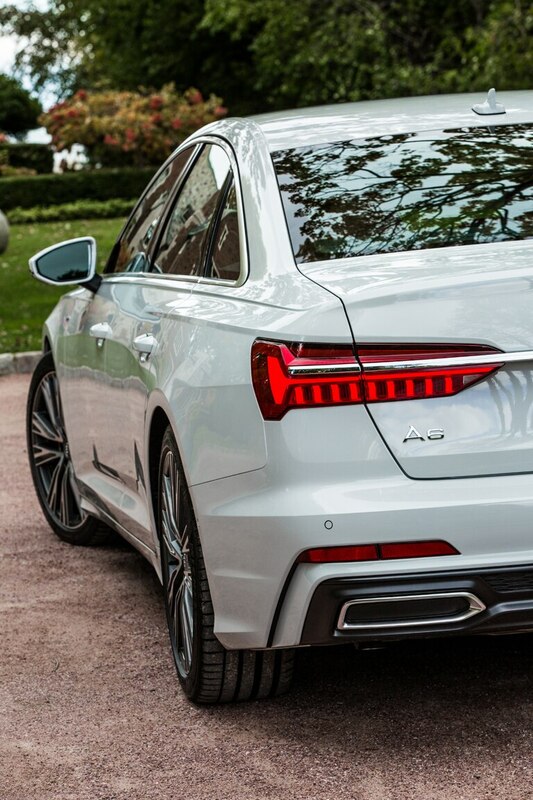 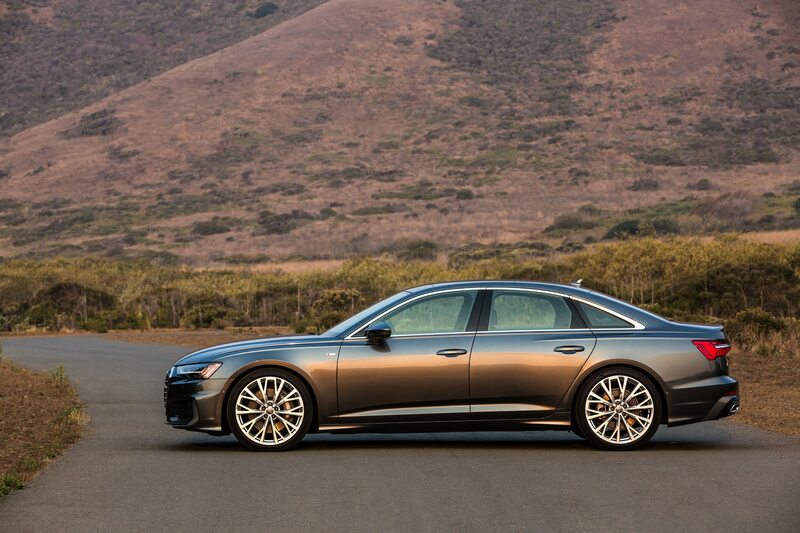 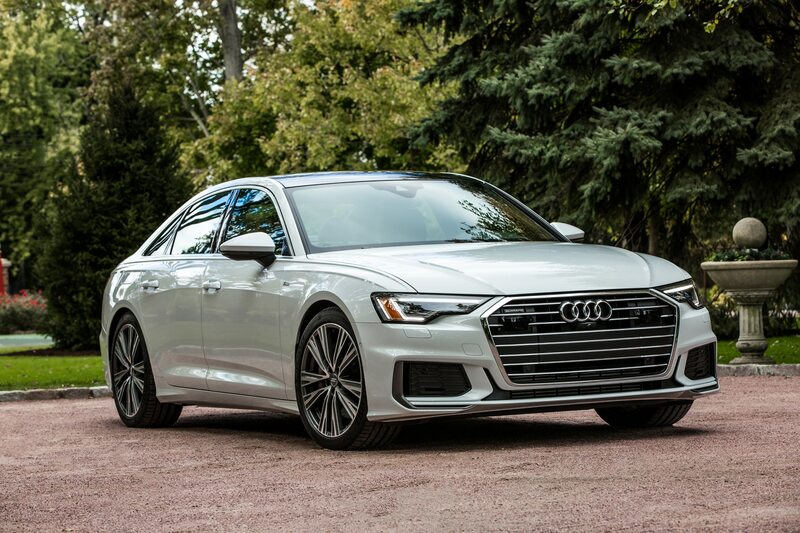 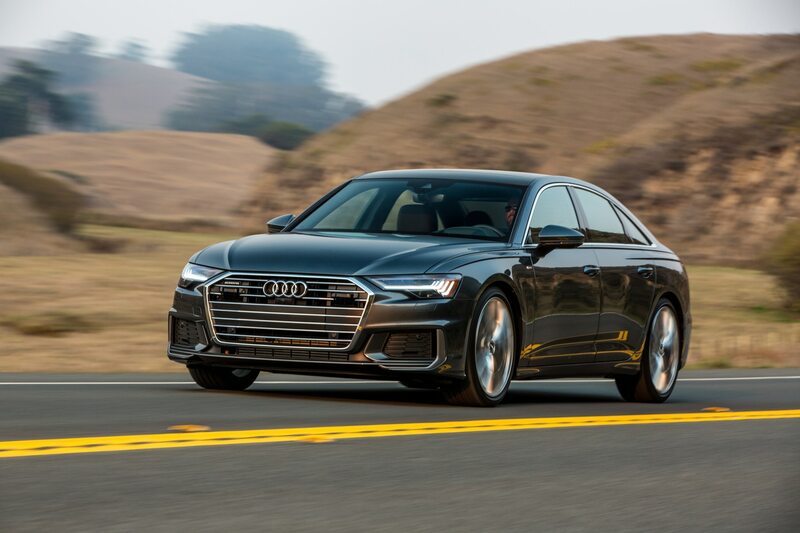 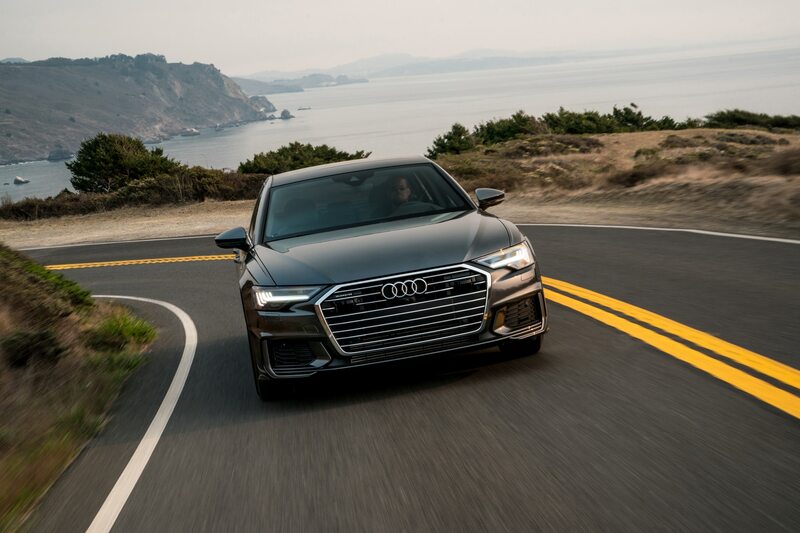 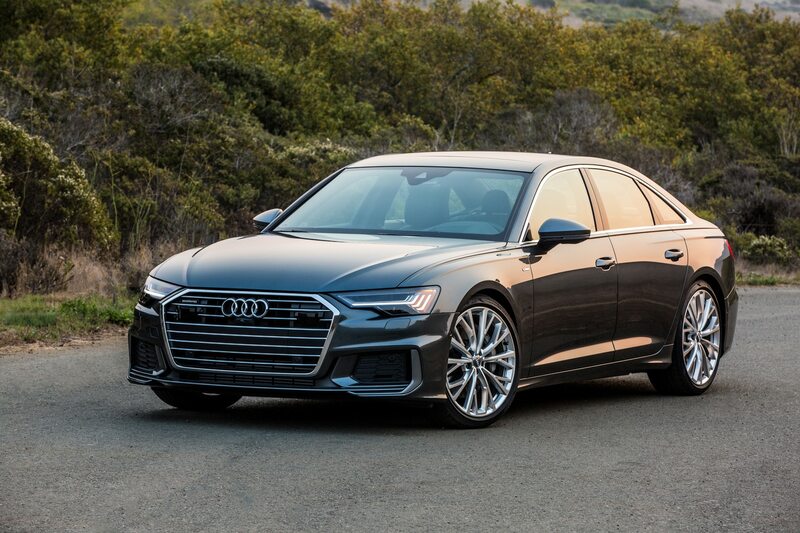 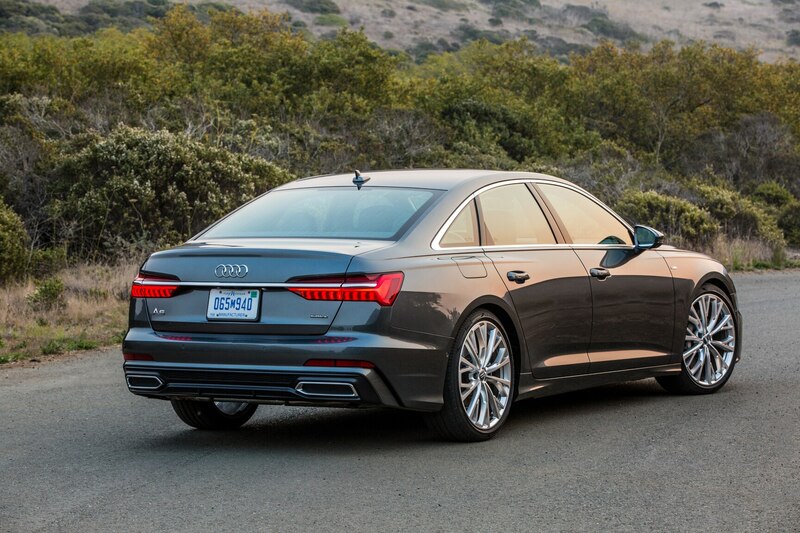 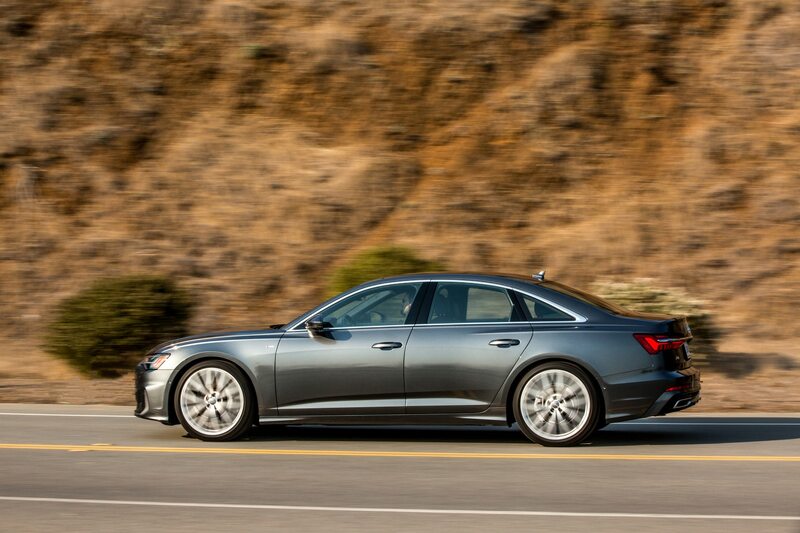 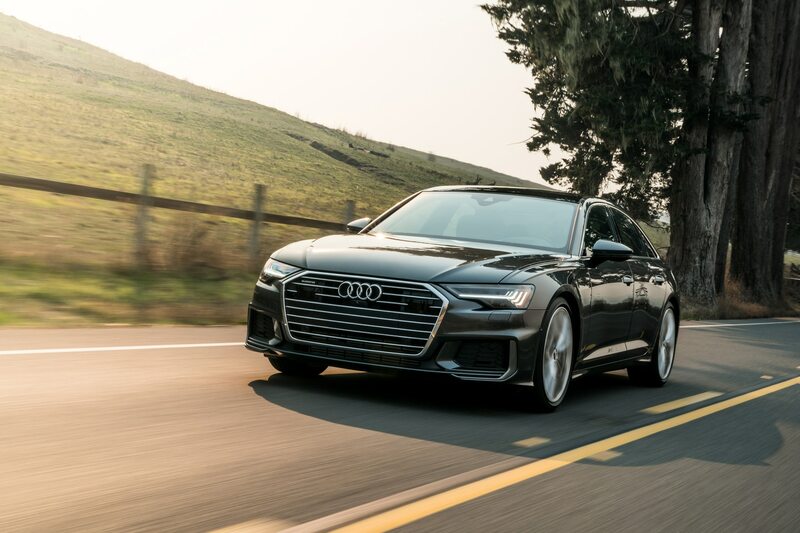 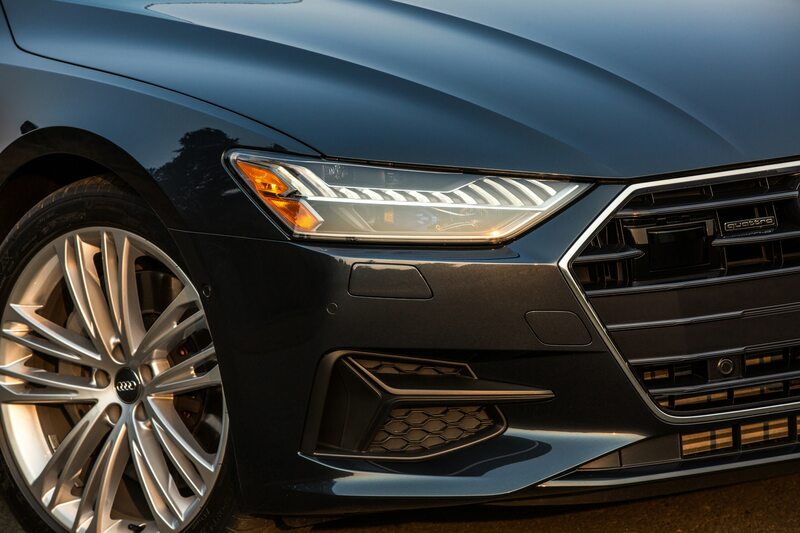 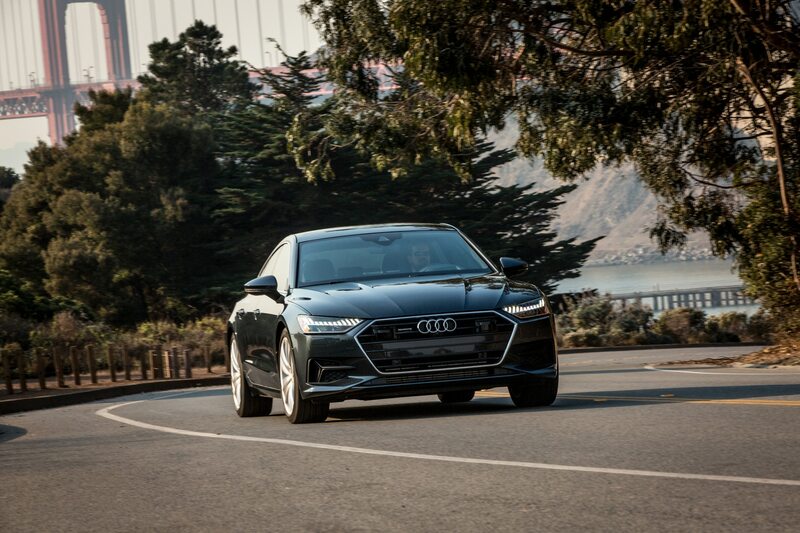 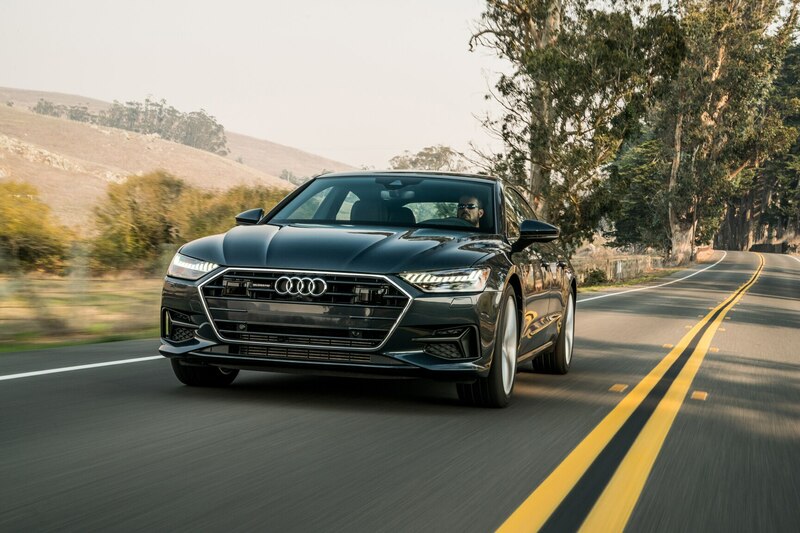 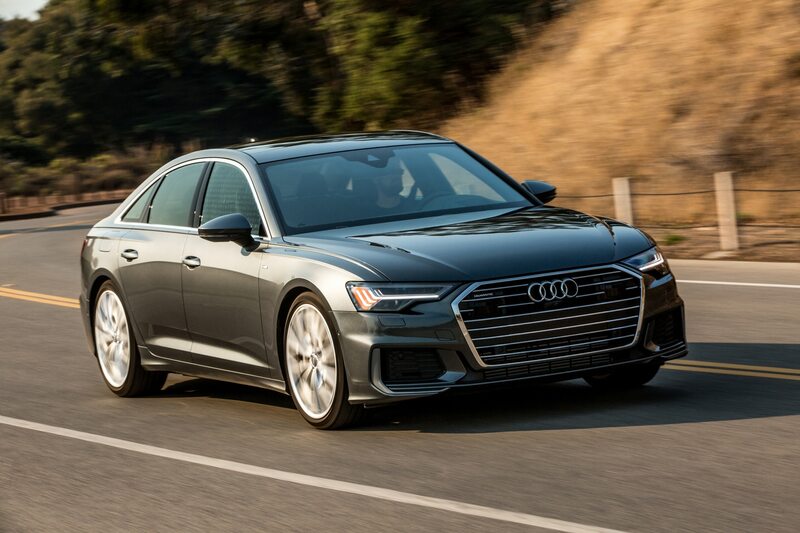 The adjective that applies most to the ’19 Audi A6 and A7 is “smooth.” Despite taut handling for cars their size, the A6 and A7 are firm but comfortable, with their optional adaptive suspension systems. 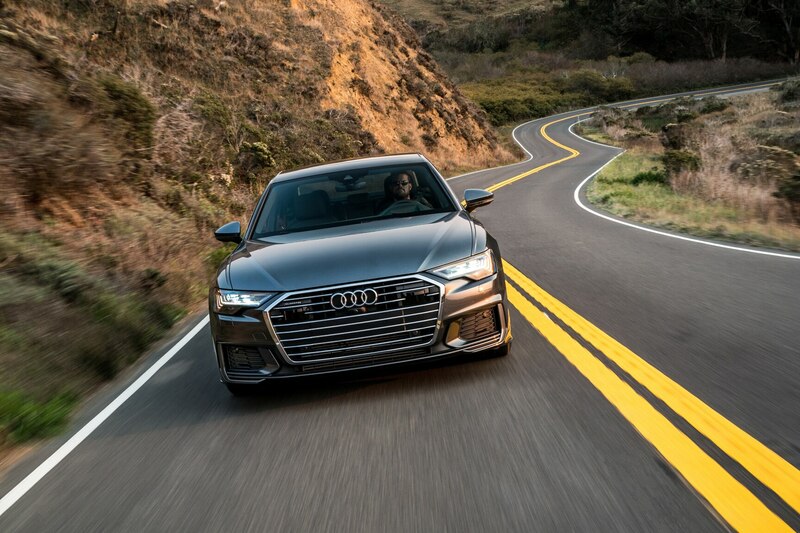 You’ll feel cruddy surfaces and the jounce of road dips. 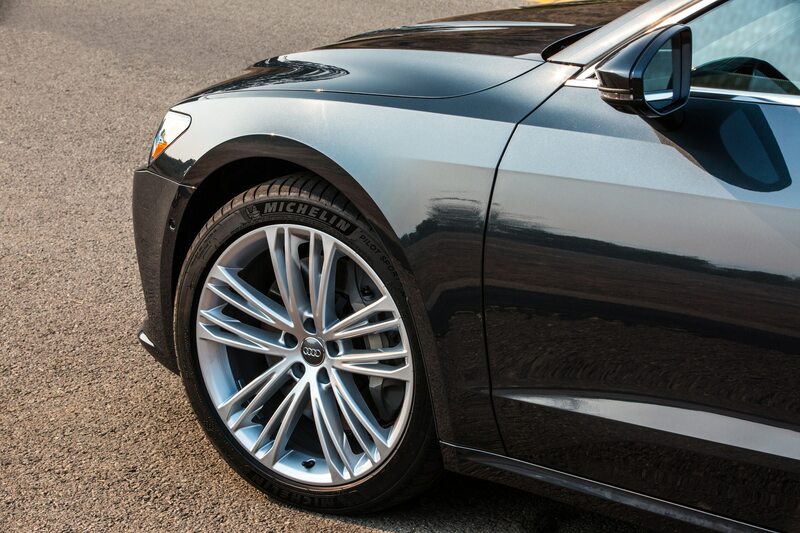 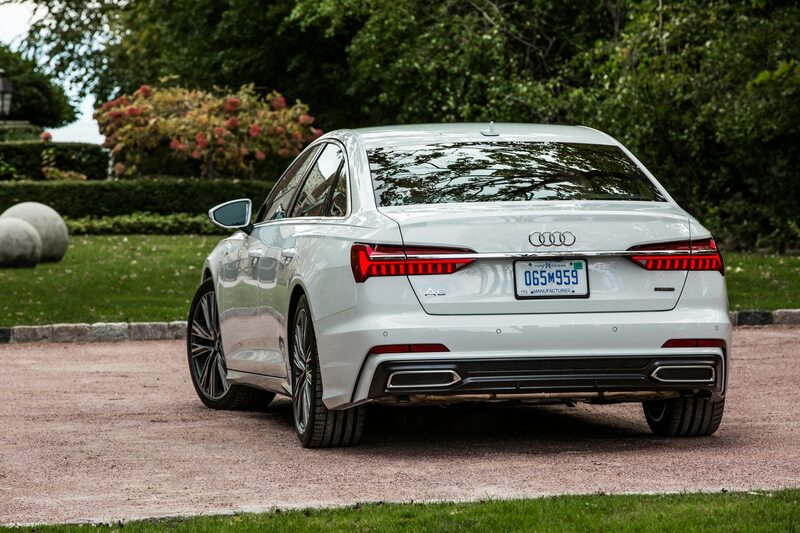 Both our A6 Prestige and A7 S-Line were on optional 21-inch wheels, after all. 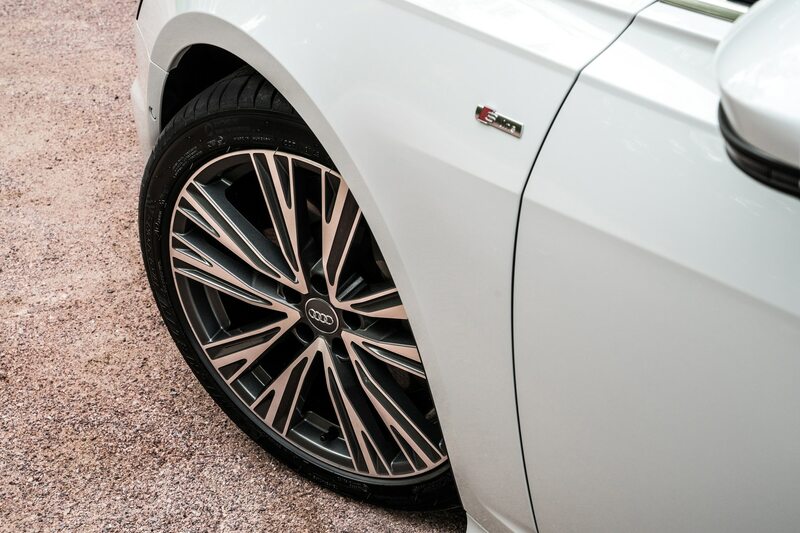 They’re also available with 19s or 20s. 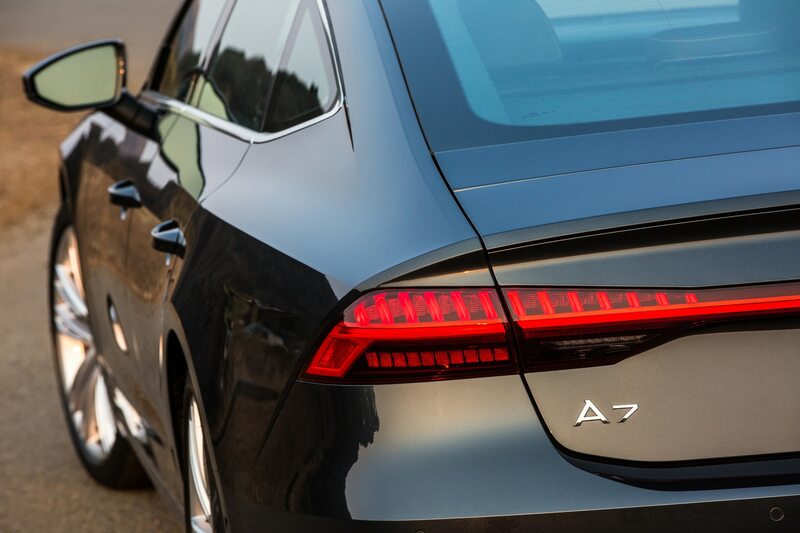 Both cars are very quiet, although the A7 has a slight bit of wind and road noise attributable to its hatchback and frameless doors. 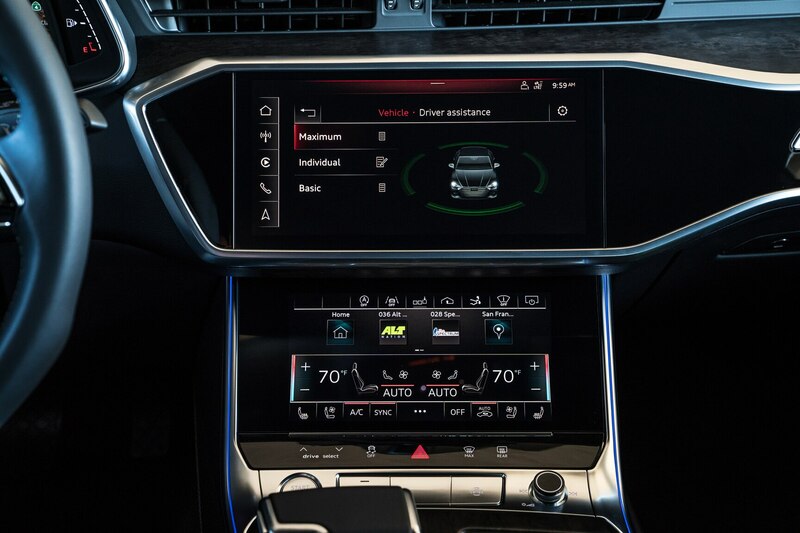 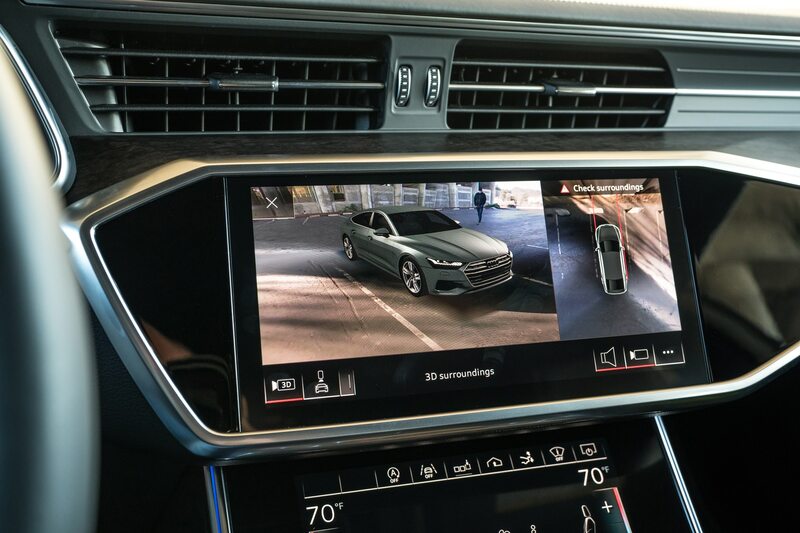 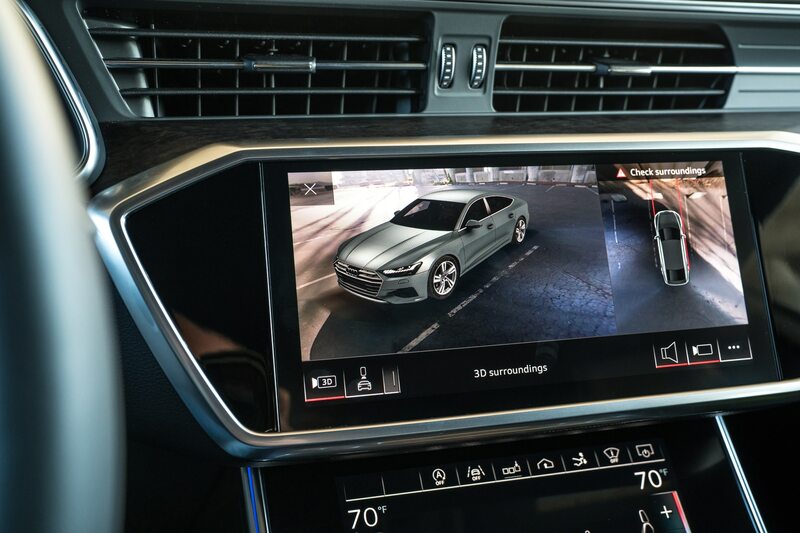 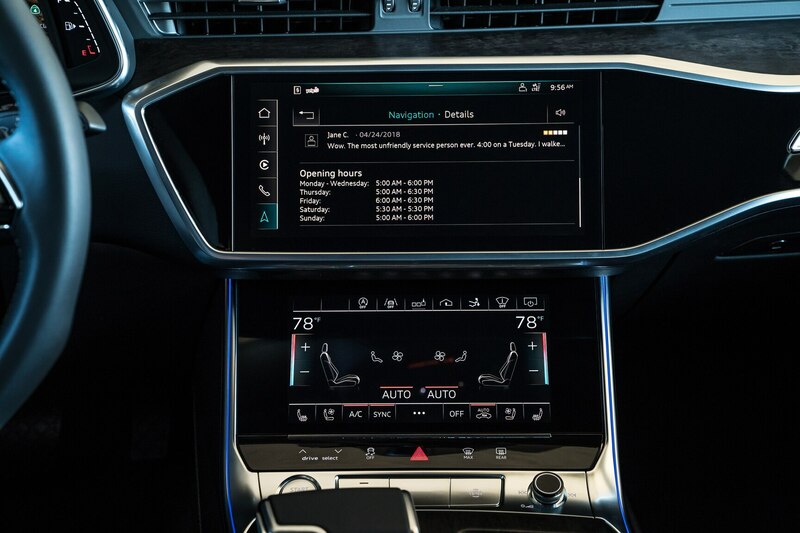 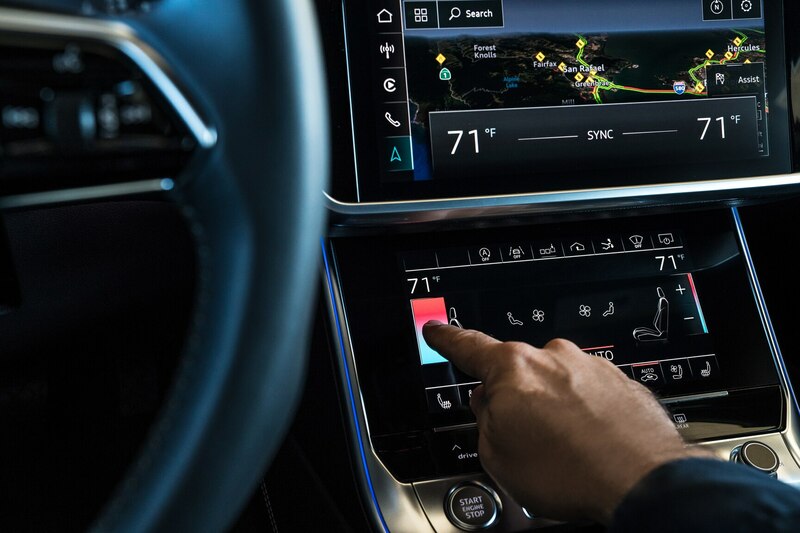 If you get tired of all this by the time you reach the straight and boring Interstate, a Level II driver assistance (autonomy) system includes steering assist and full-stop adaptive cruise control. 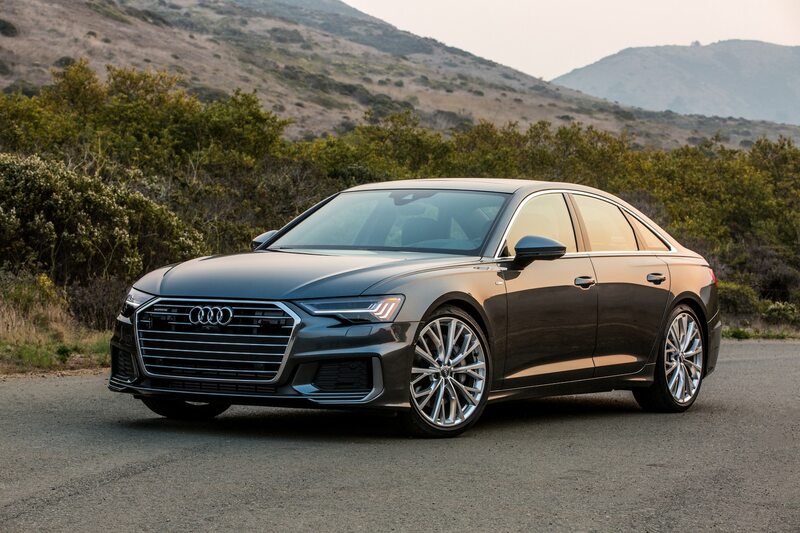 Audi’s unusual aluminum and steel MLB platform is upgraded to “MLB Evo” for the ’19 A6 and A7, says Anthony Foulk, senior project manager for all the models on the architecture, which includes the Q7, the new A8 and the upcoming Q8 SUV “coupe.” While the A6/A7’s primary competitors, the Mercedes-Benz E- and CLS-Class and the BMW 5 and 6 Series have reverted to all-new turbocharged inline six-cylinder engines driving the rear or all wheels, the Audis stick with the longitudinal V-6 placed well over the front axle, with a long front overhang and a front-wheel-drive dash-to-axle proportion to accommodate the transmission behind the engine of this FWD-based AWD car. 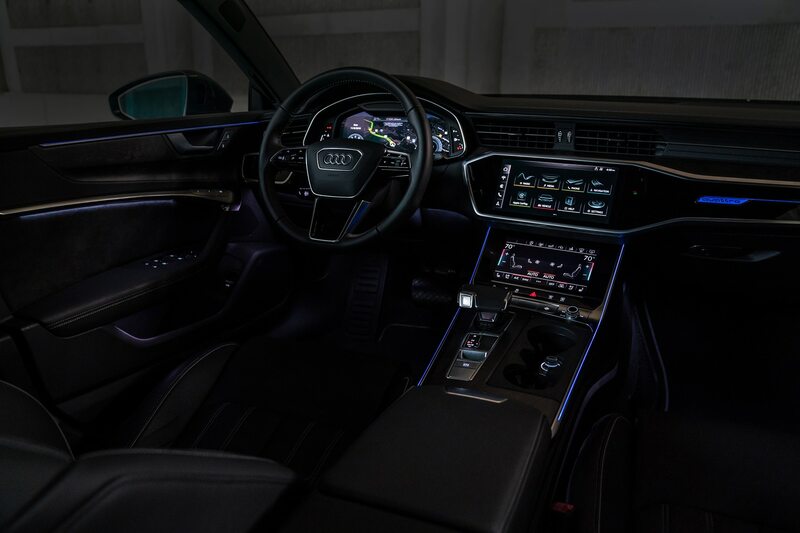 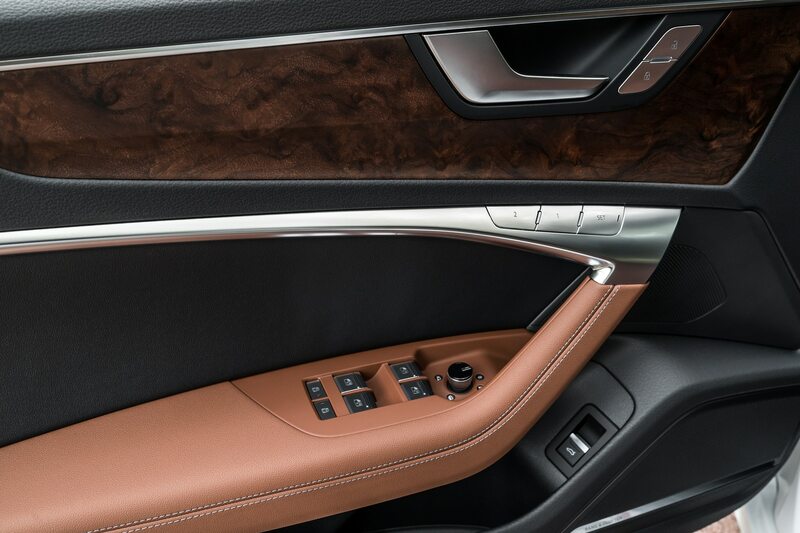 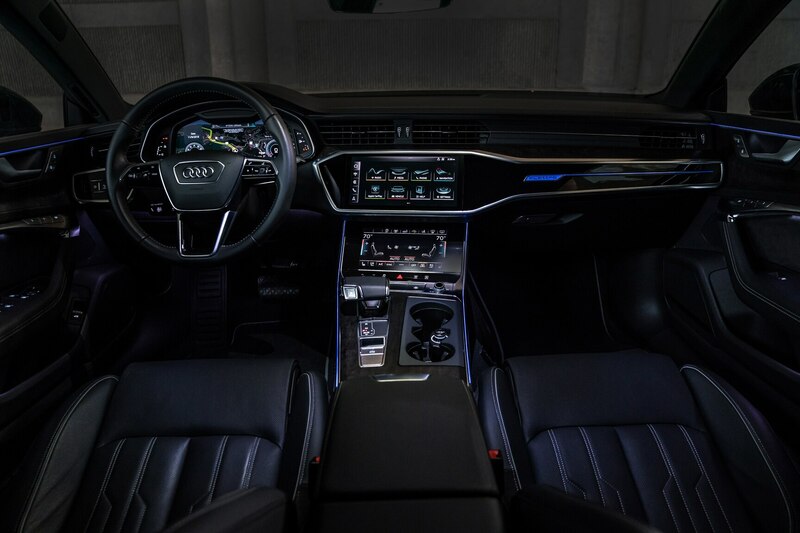 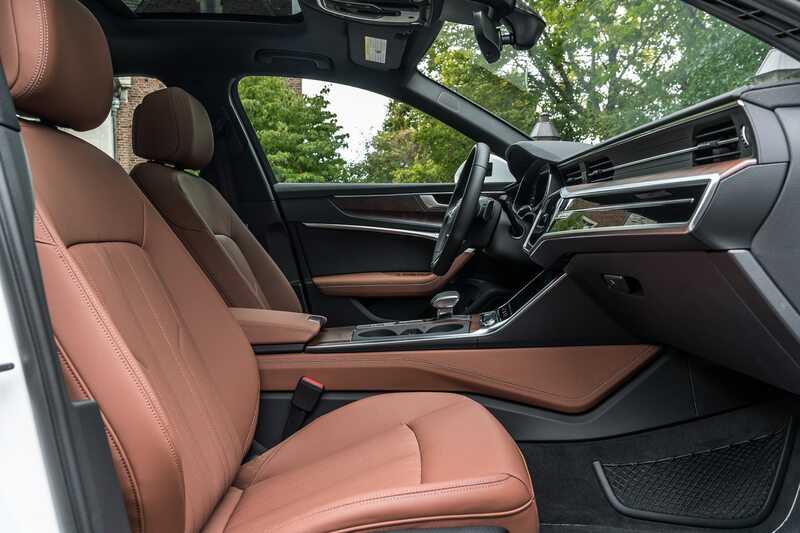 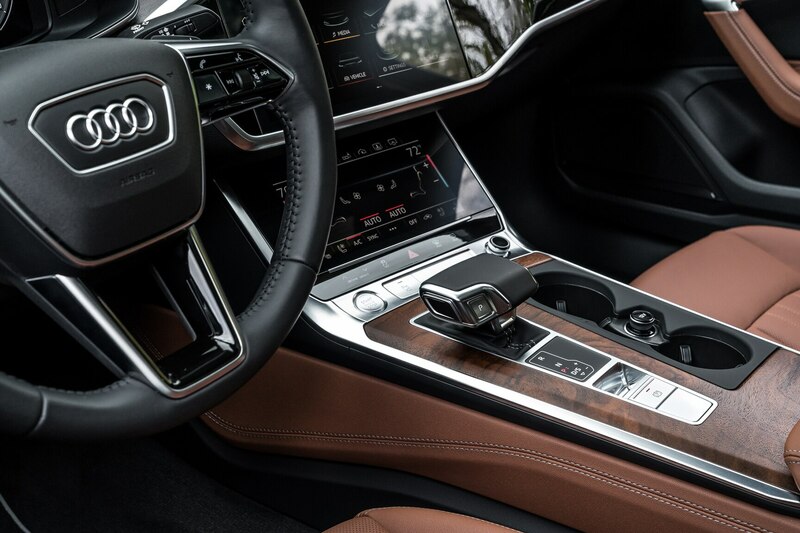 Some luxury car consumers will find the Audi brand’s stylishness, high-design interiors and leading edge electronics compelling enough to overlook the unusual layout. 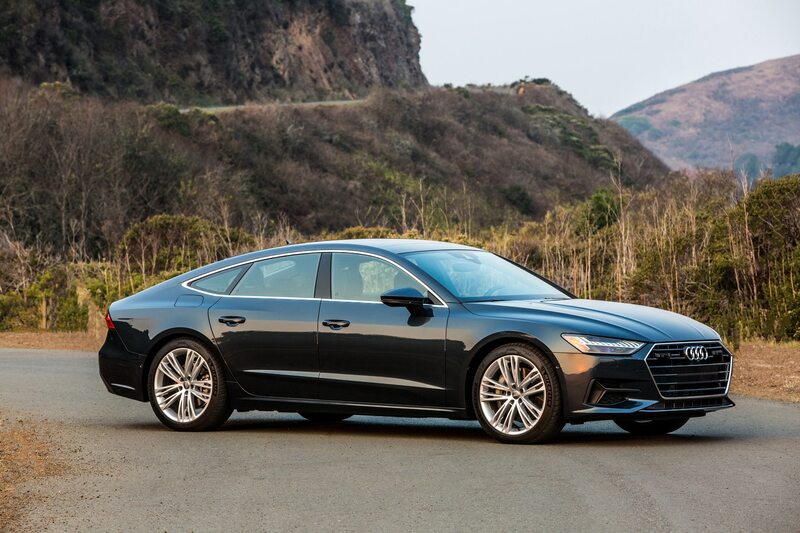 On the rare occasions when they find themselves trying to handle the Audi A6 or A7 as if it was an R8, or at least a TT, they won’t be too disappointed they’re not driving one of those RWD-based competitors.